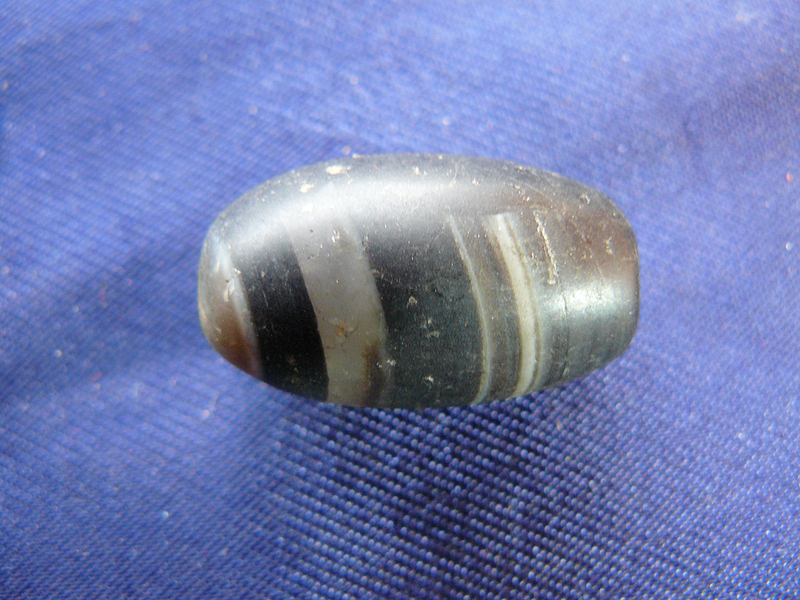 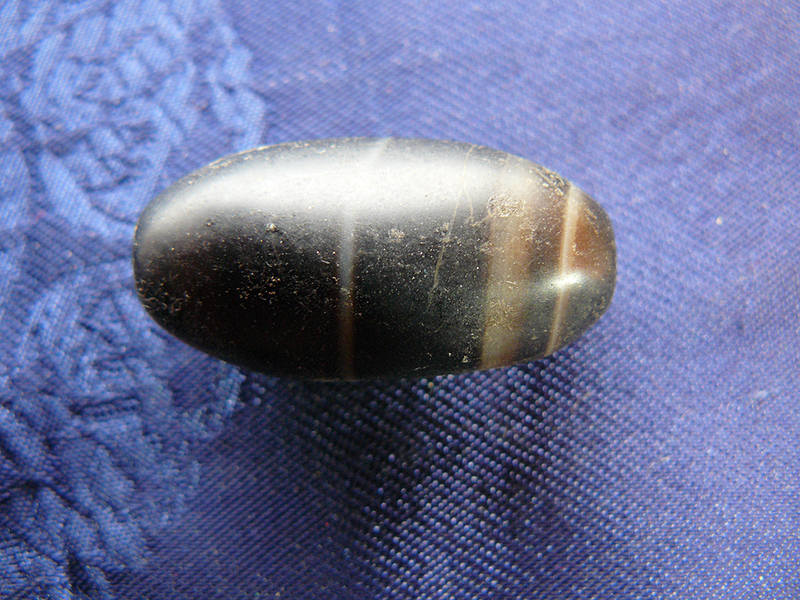 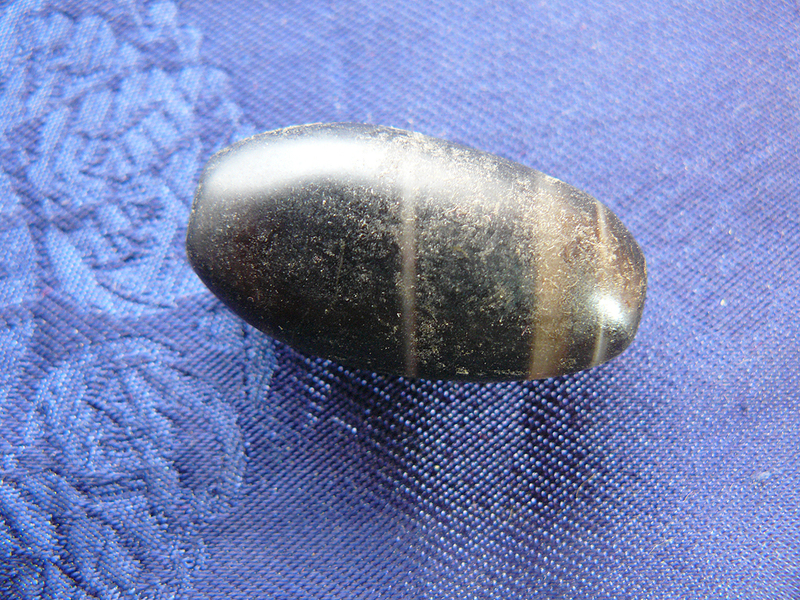 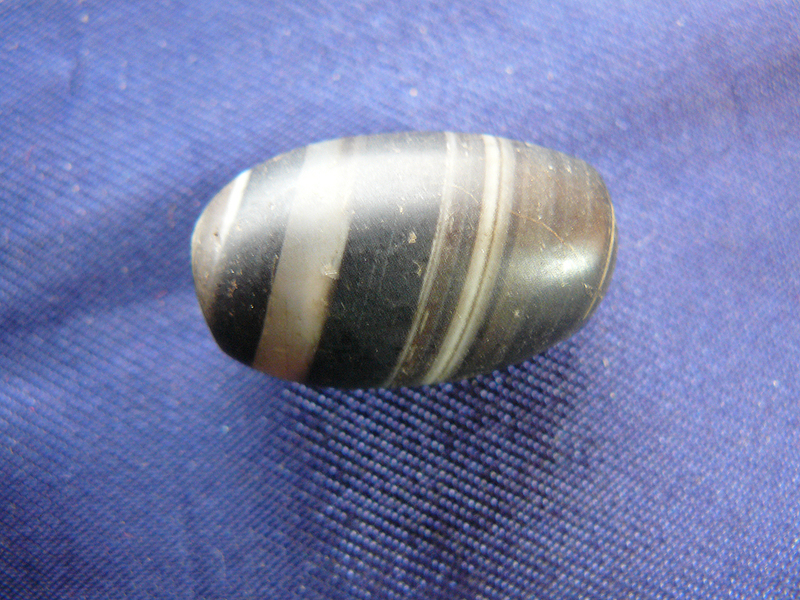 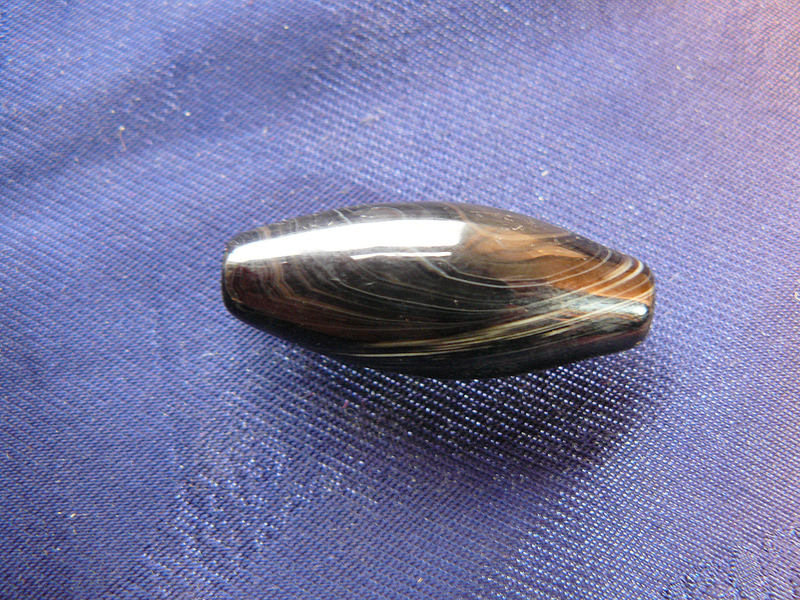 Tibetan 'amber'. 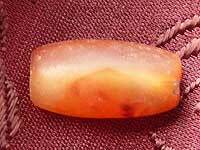 Proper Amber is fossilised tree resin, millions of years old. 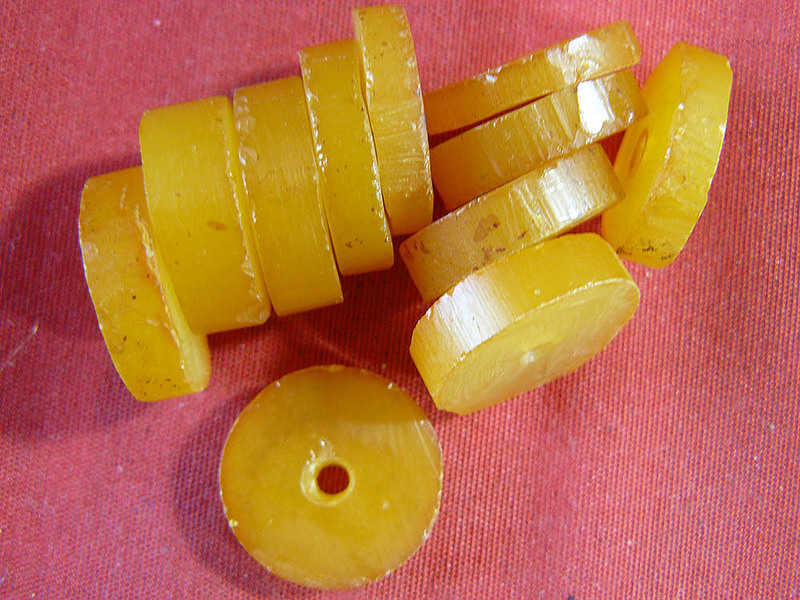 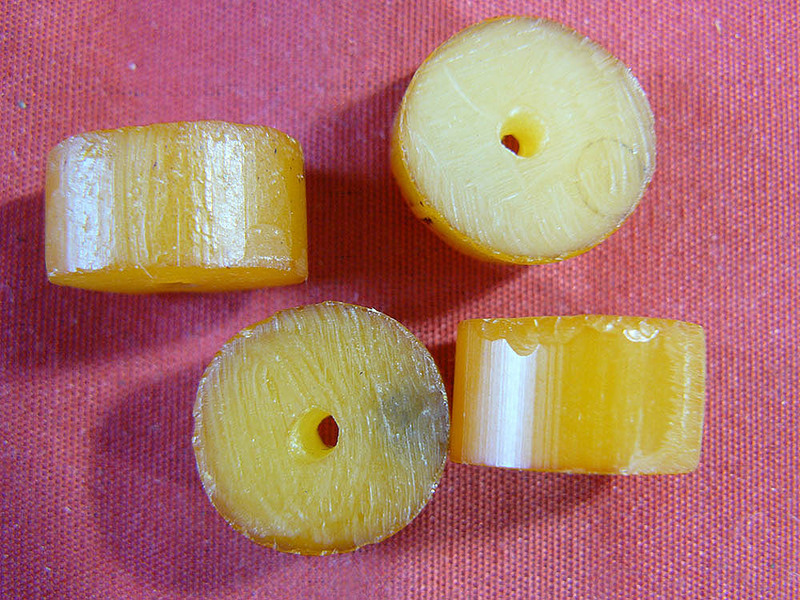 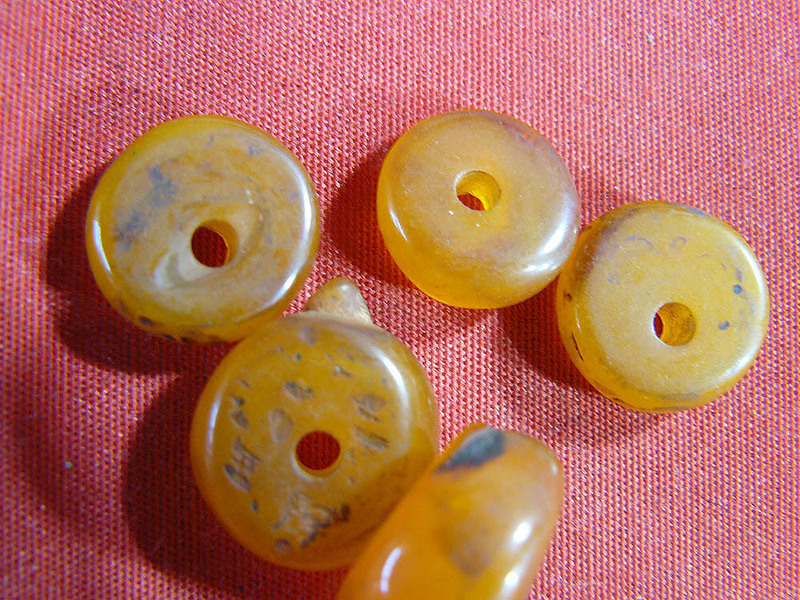 Most amber made into beads in Tibet is made from tree resin, but it has not yet fossilised. 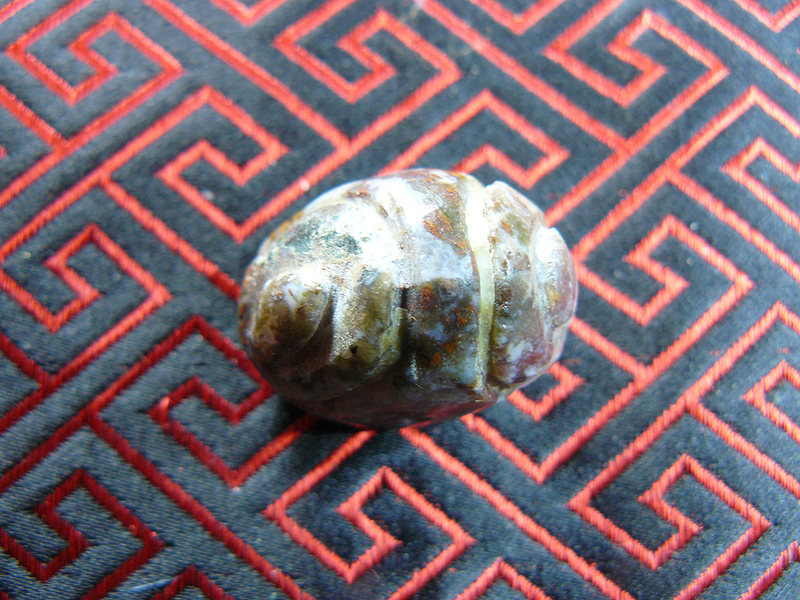 Sometimes it is fairly old, thousands - but not millions of years - and sometimes it is newer. 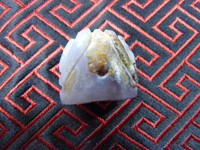 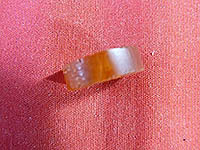 Tecnically it is not amber because it has not been fossilised. 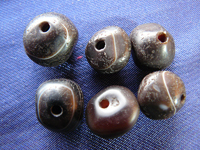 Lovely old beads, several in stock. A pair of Tibetan 'Amber' bead with some age. 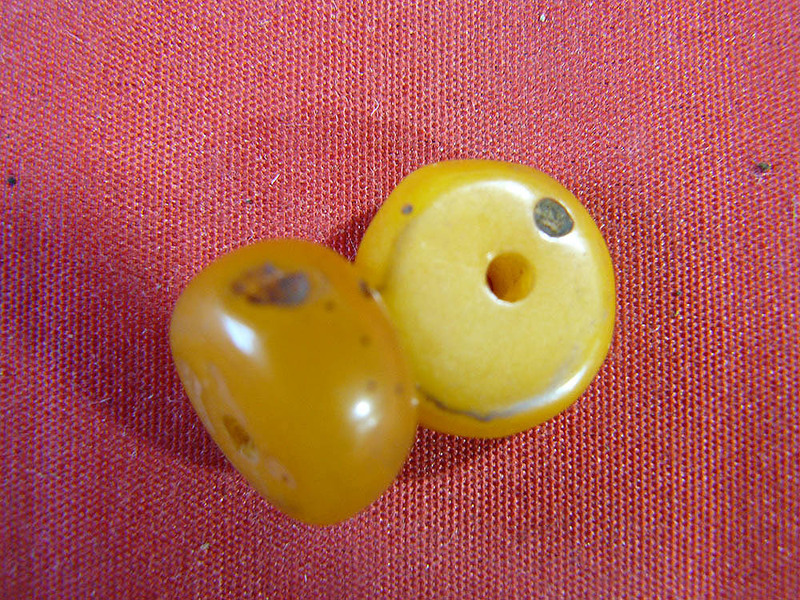 Lovely old beads. 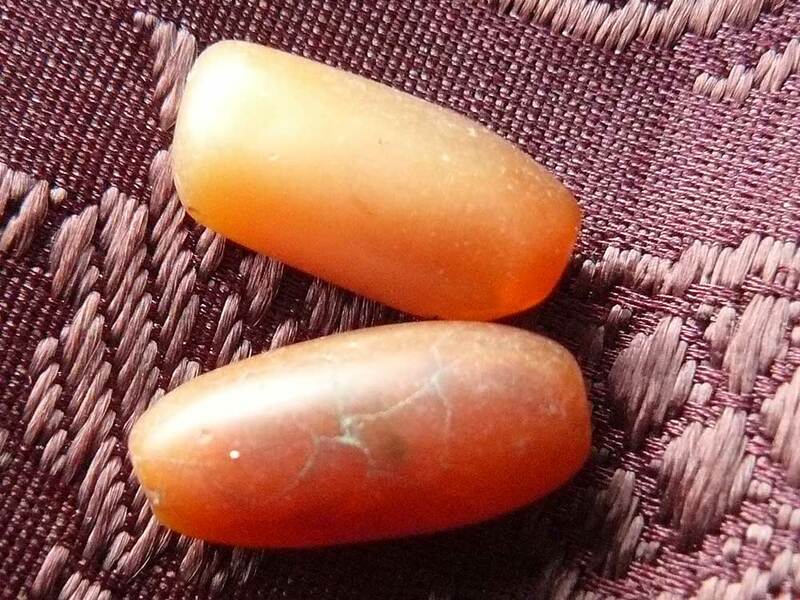 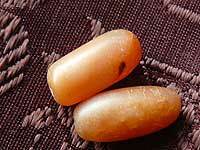 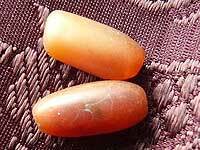 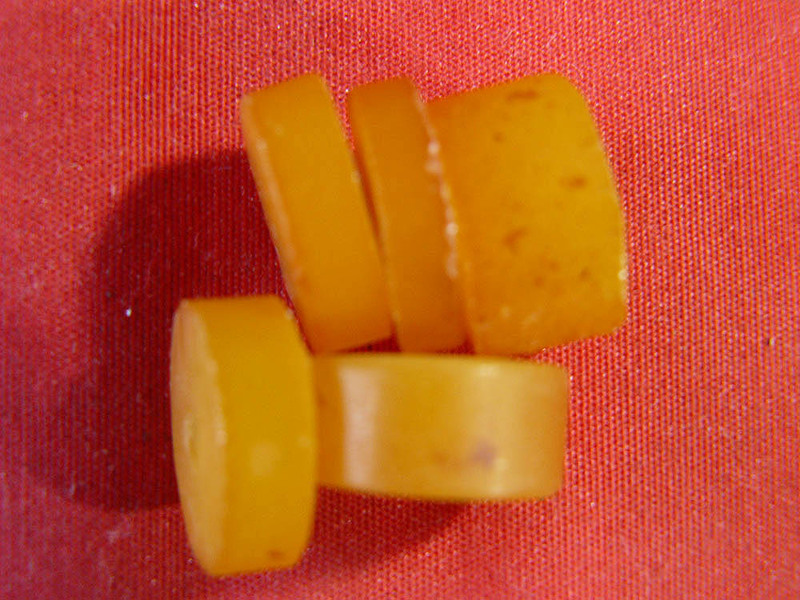 A pair of Tibetan 'Amber' bead with good age. 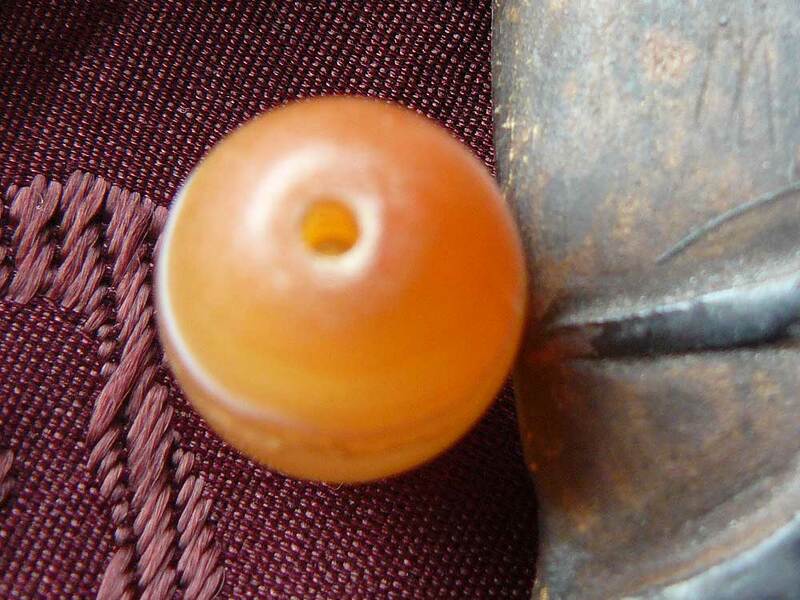 Lovely old beads. 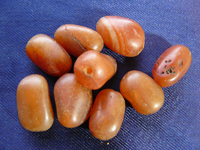 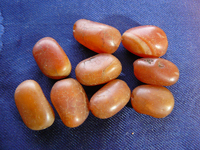 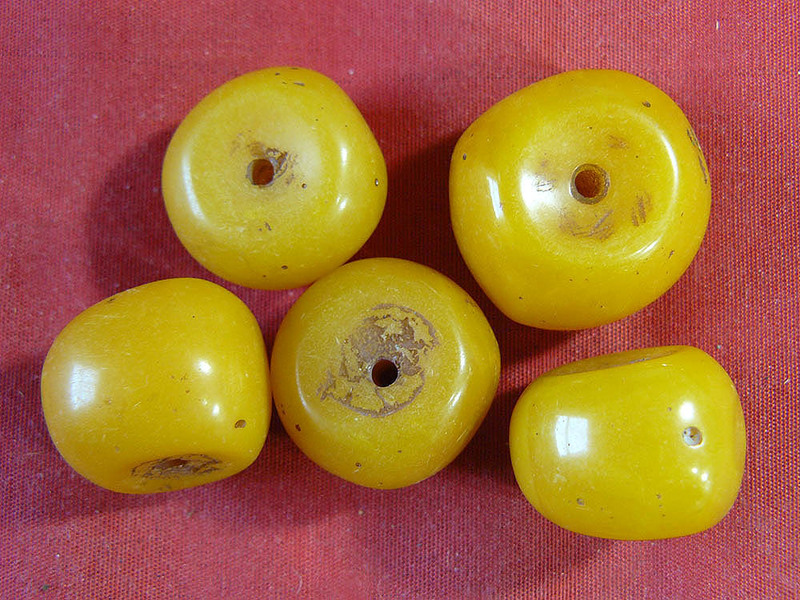 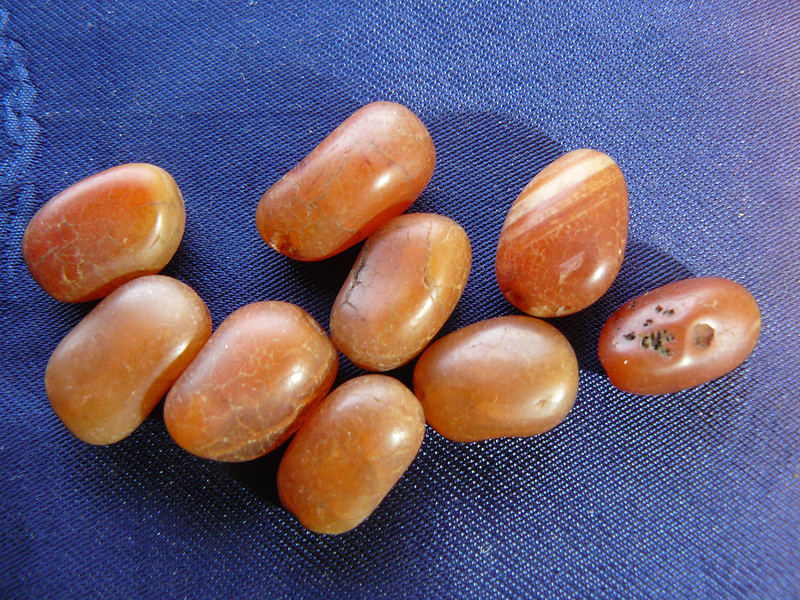 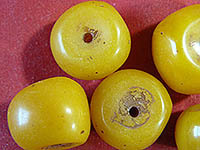 These are unworked high quality beads which are quite possibly true amber rather than Himalayan 'amber'. They came in a batcvh of unworked amber beads from a Tibetan craftsman. 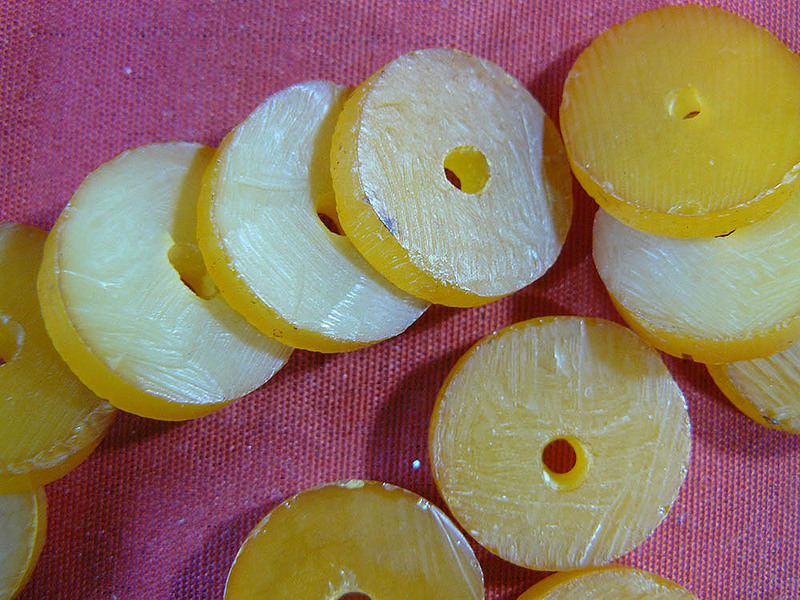 They are raw, rough shape, and need idealy to be polished and possibly rounded off - an easy job with sand paper. These are four chunky matched beads which would have many uses. 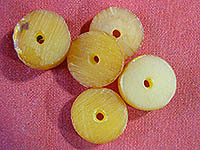 These are five chunky beads which would have many uses. 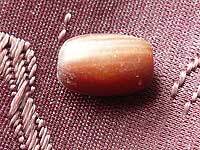 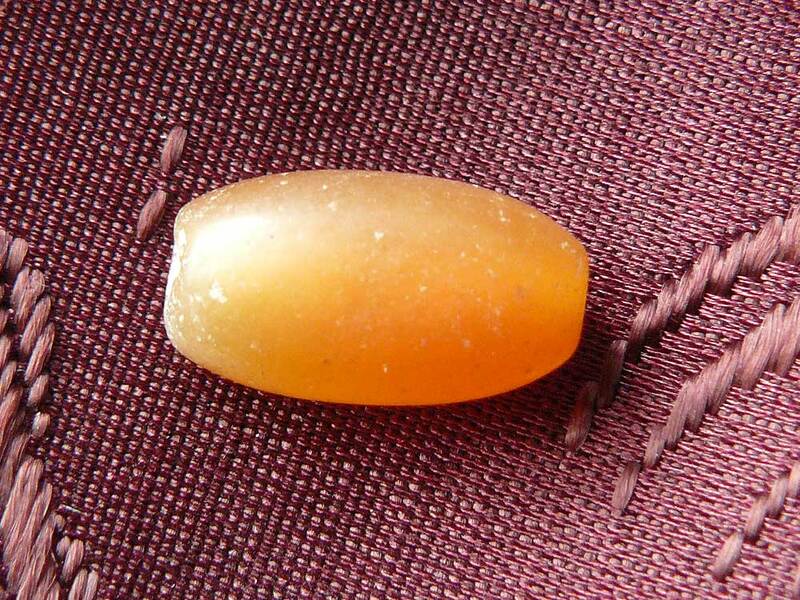 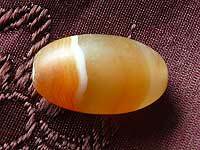 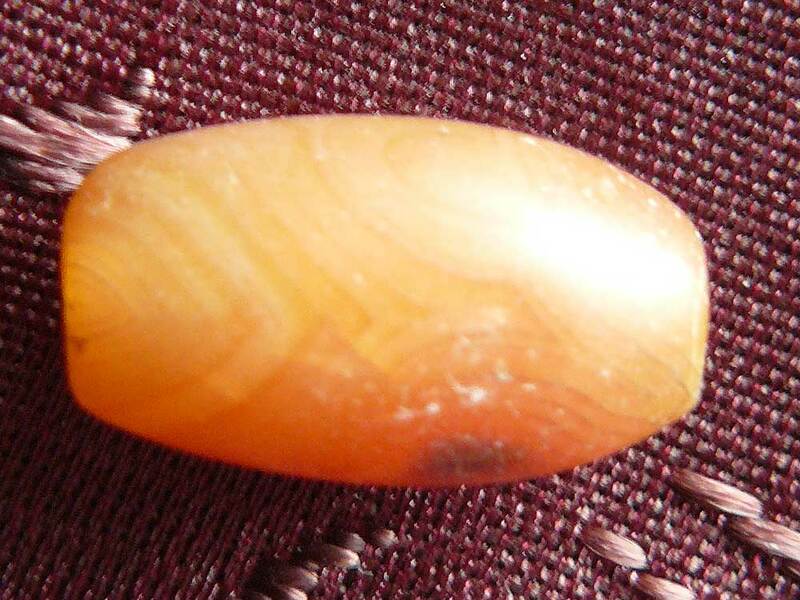 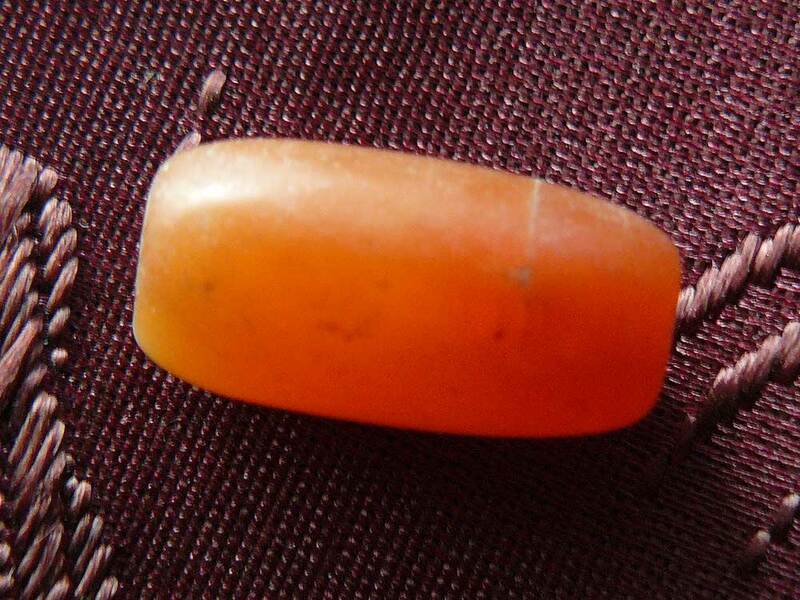 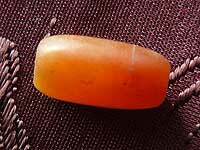 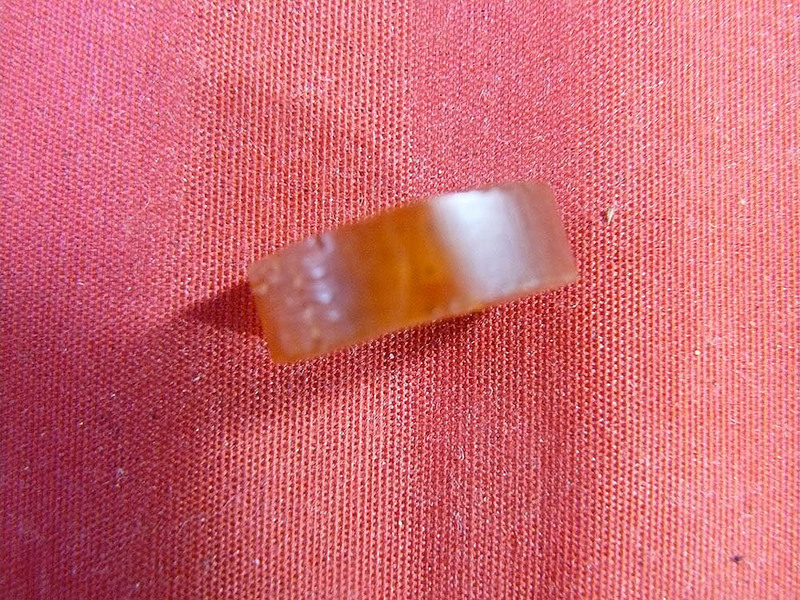 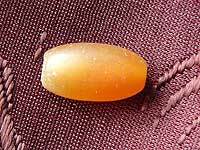 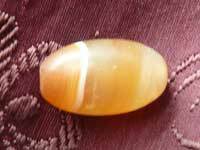 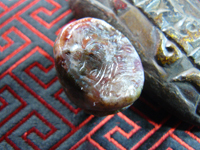 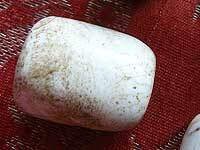 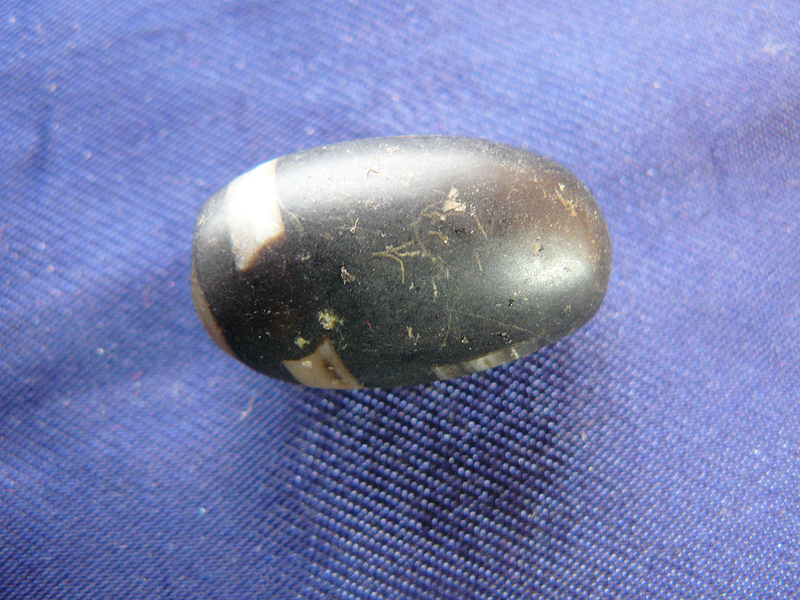 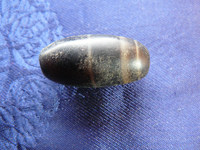 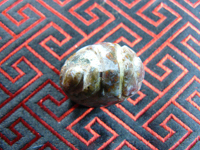 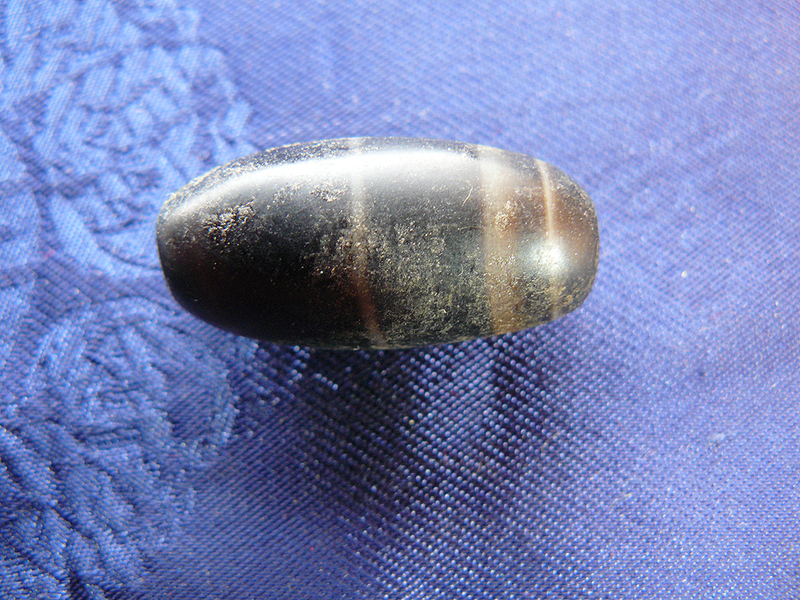 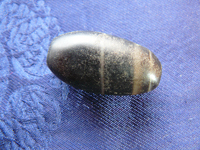 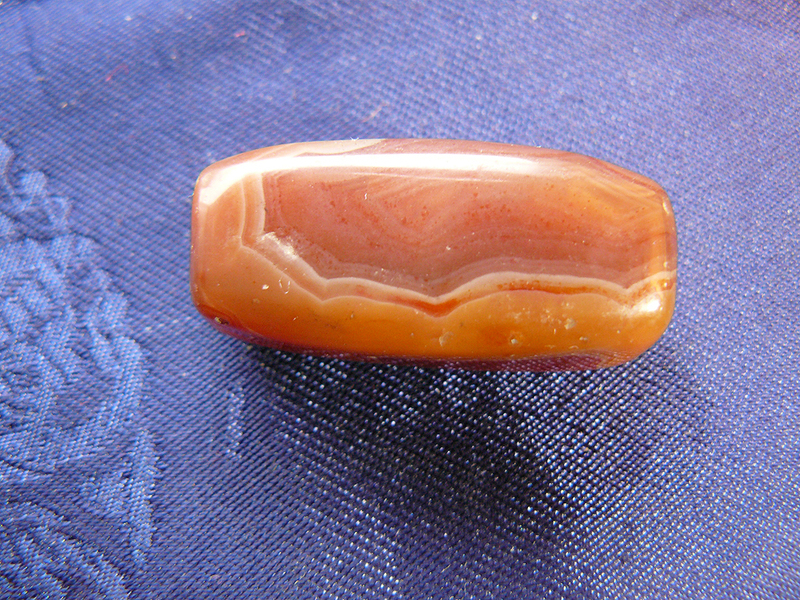 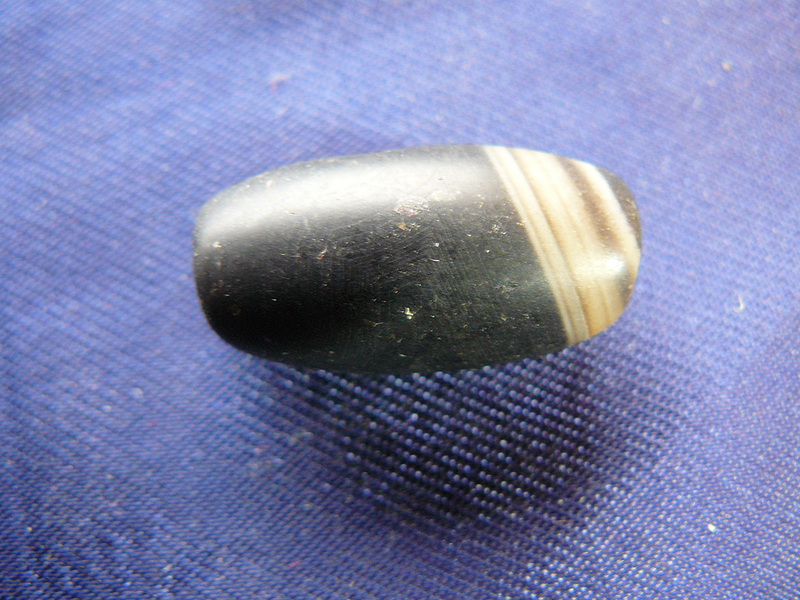 An unworked high quality bead which are quite possibly true amber rather than Himalayan 'amber'. 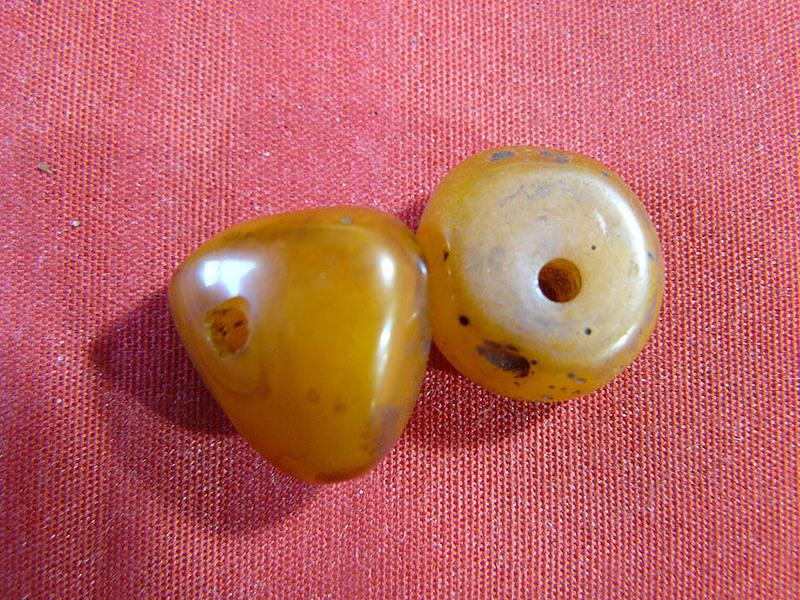 They came in a batcvh of unworked amber beads from a Tibetan craftsman. 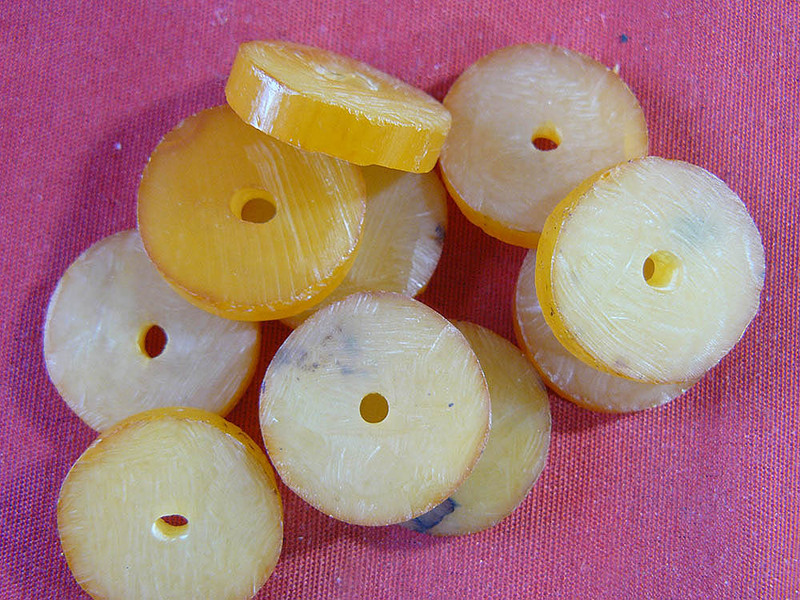 They are raw, rough shape, and need idealy to be polished and possibly rounded off - an easy job with sand paper. 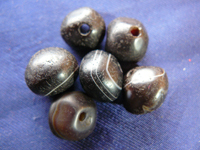 This is chunky beads of a darker colour than the rest, which would have many uses. 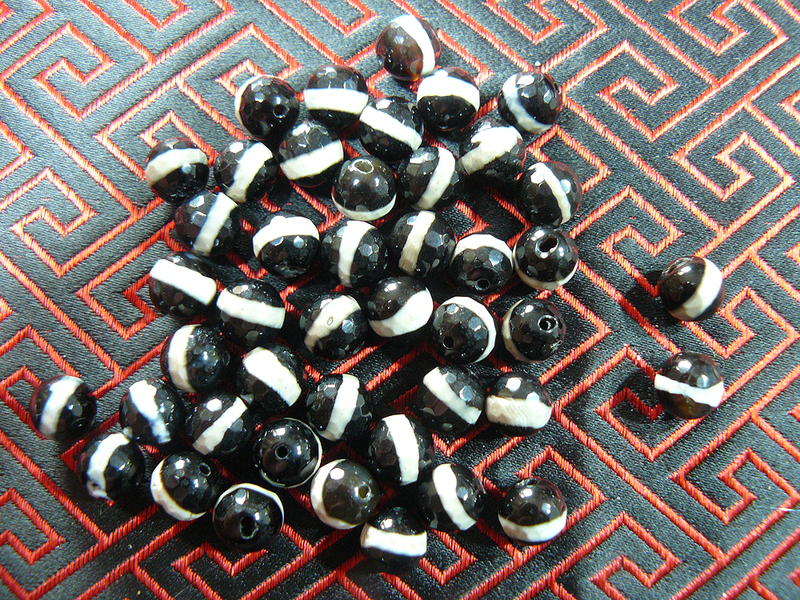 These are chunky beads which would have many uses. 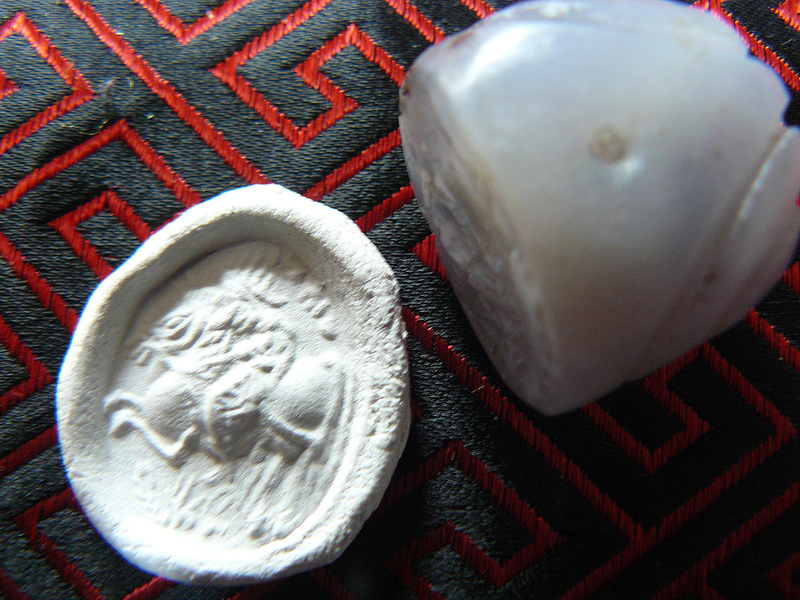 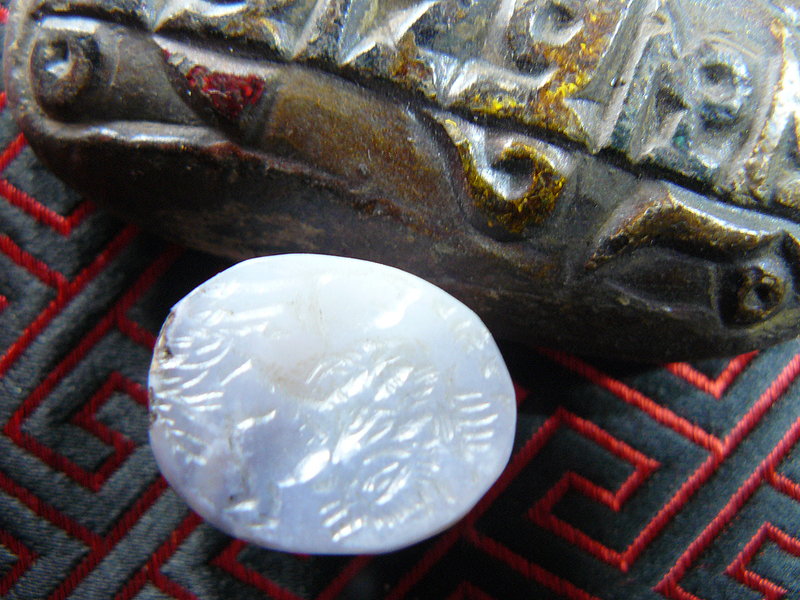 A carved stone seal bead depicting a mounted rider and horse as shown in the plaster cast in the photo. 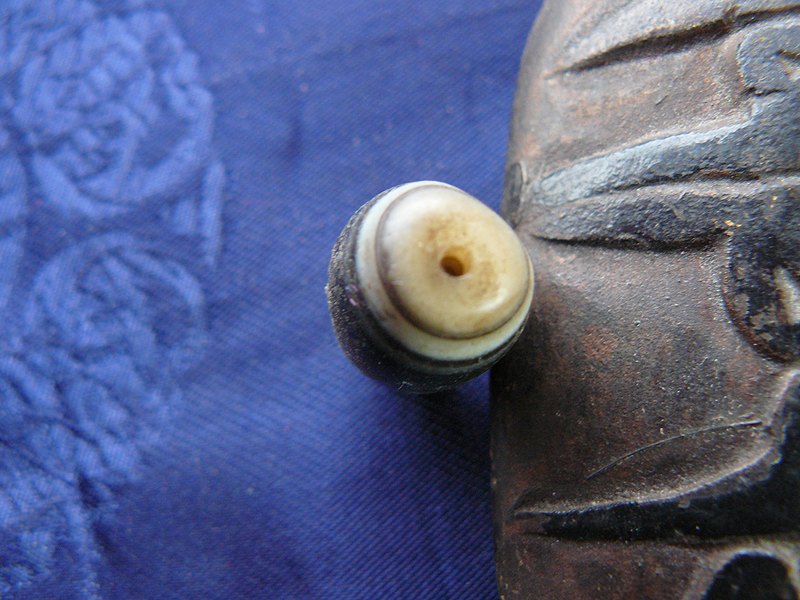 The bead is beautifuly carved but I do not know if it is truly ancient or a more modern copy. 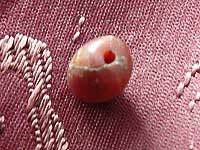 Whether ancient or not, the bead is beautiful for jewllery making or as wearing as an ancestor amulet. A carved stone seal bead depicting a figure as shown in the plaster cast in the photo. The bead is beautifuly carved but I do not know if it is truly ancient or a more modern copy. 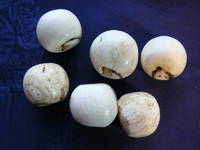 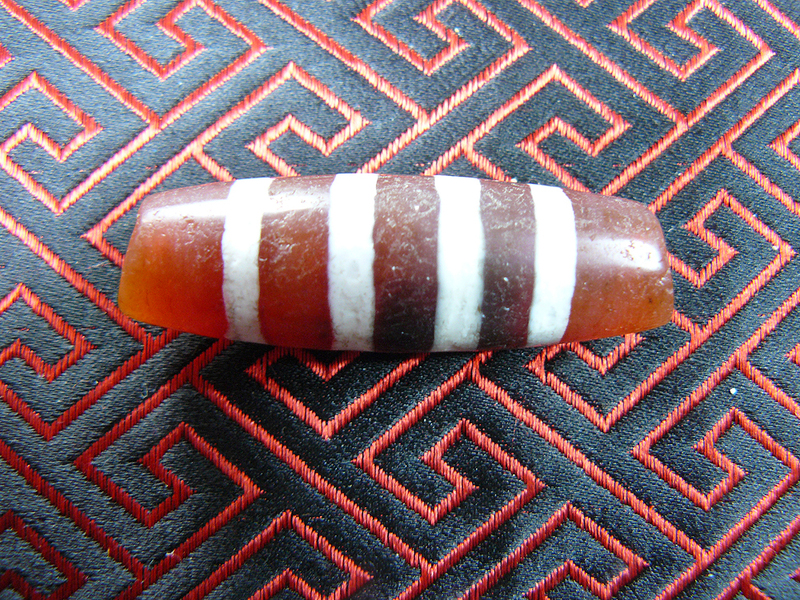 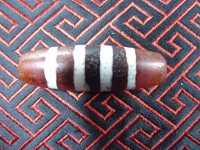 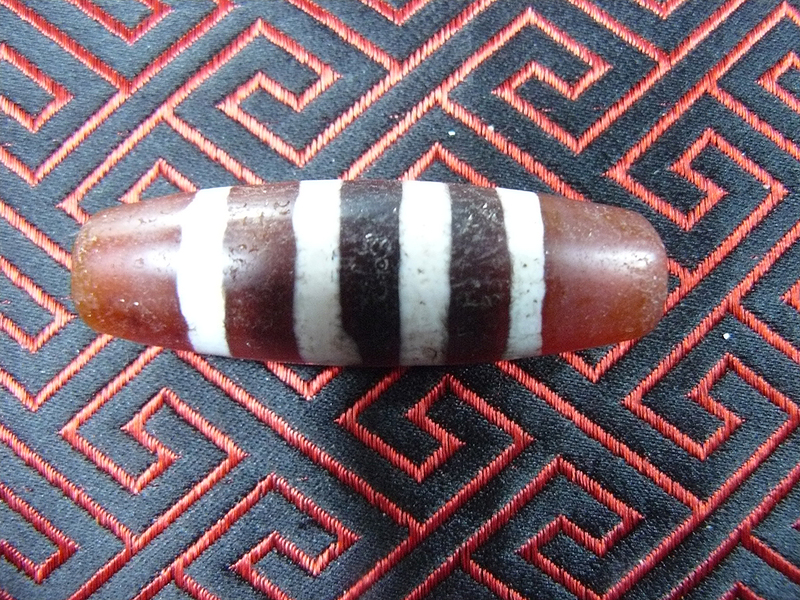 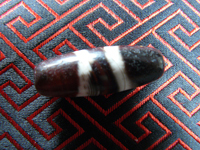 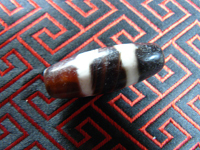 Orginal ancient, roughly round, natural banded agate beads with large, hand bored holes. 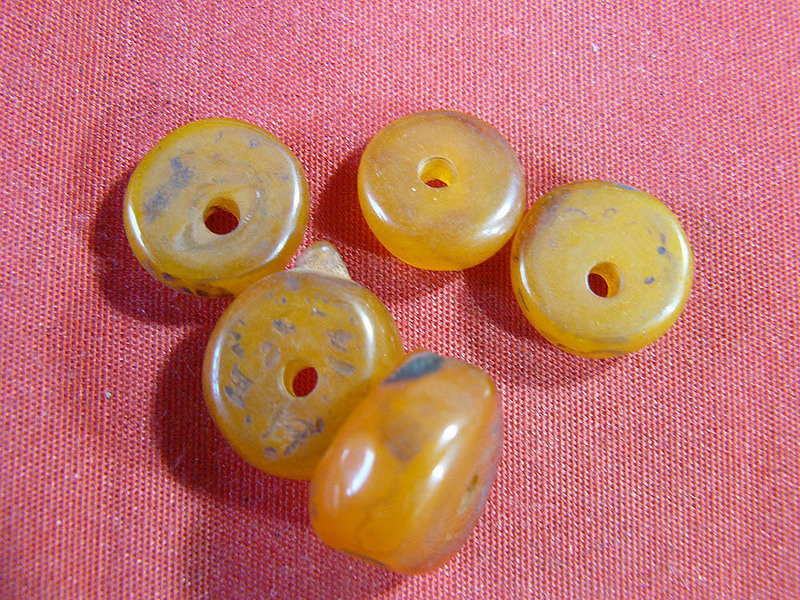 They are all in good condition and are very special. 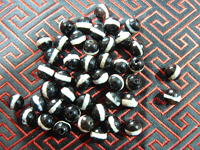 As the beads are all handmade no two are exactly the same. 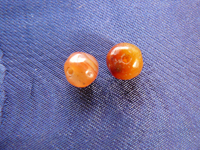 Sizes vary a little bit. 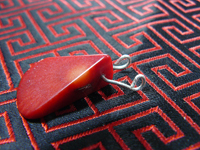 Beautiful for jewllery making or wearing as an ancestor amulet. 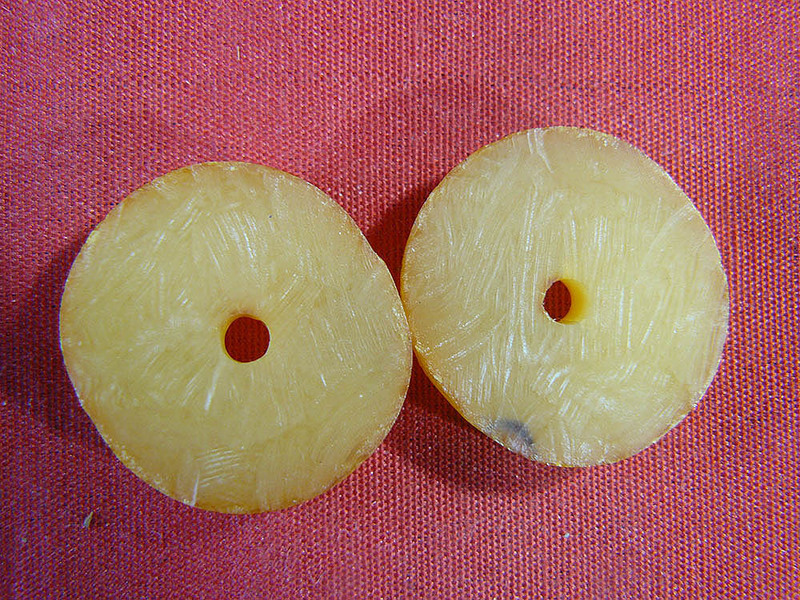 Natural banded agate beads with large holes. 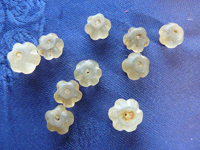 They are all in good condition and have a nice look and feel. 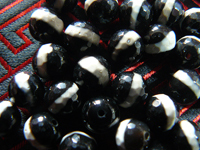 As the beads are all handmade no two are exactly the same. 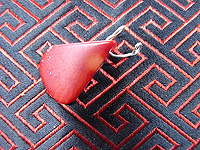 Sizes vary a little bit. Attractive natural banded agate beads with a nice patina and in good condition. 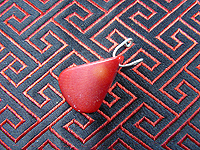 Beautiful for jewllery making or wearing as an amulet. 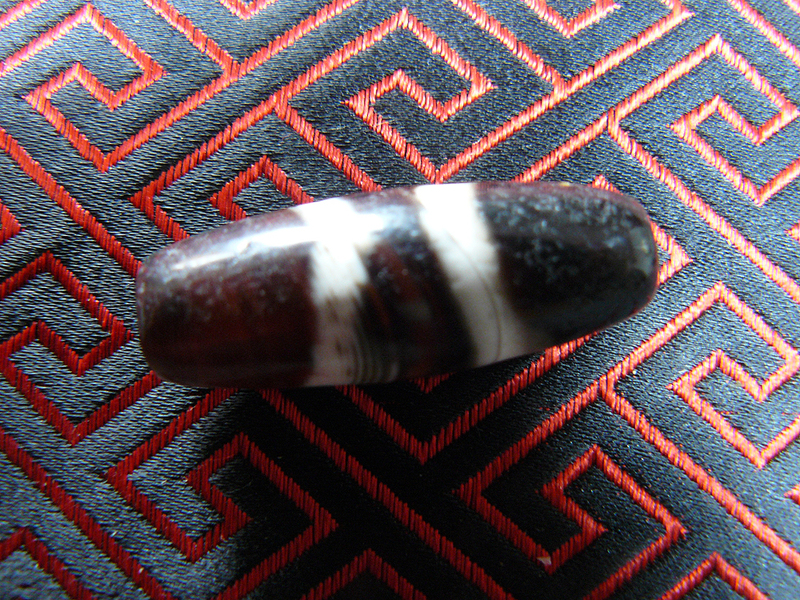 Beautiful for jewllery making or wearing as ancestor amulet. 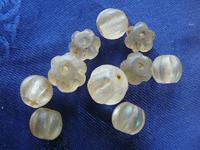 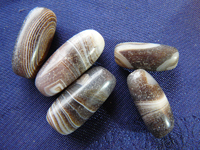 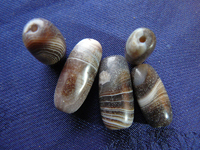 Small, round facited banded agate beads. 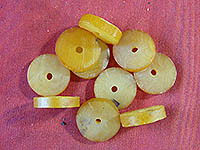 Beautiful for jewllery making. 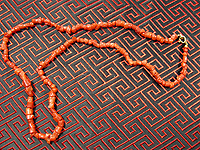 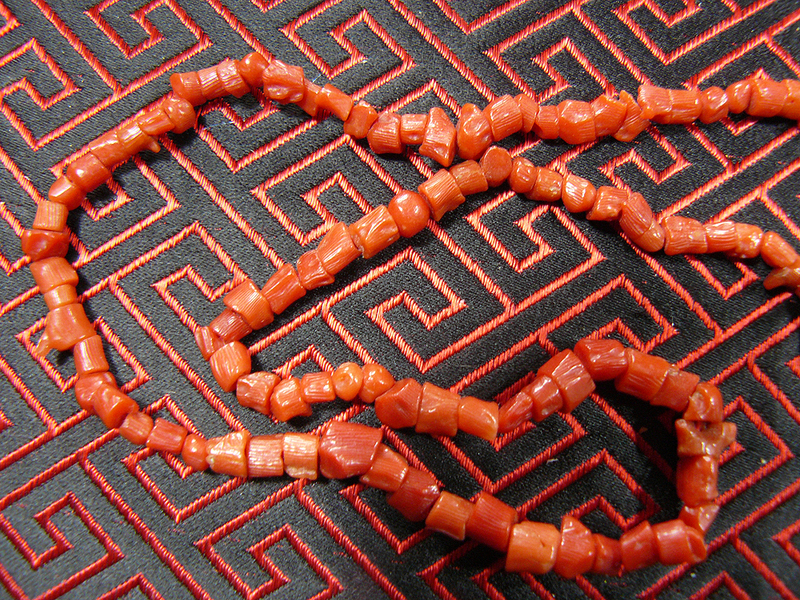 These are large, old and rare pink Mediterranean coral amulet beads. 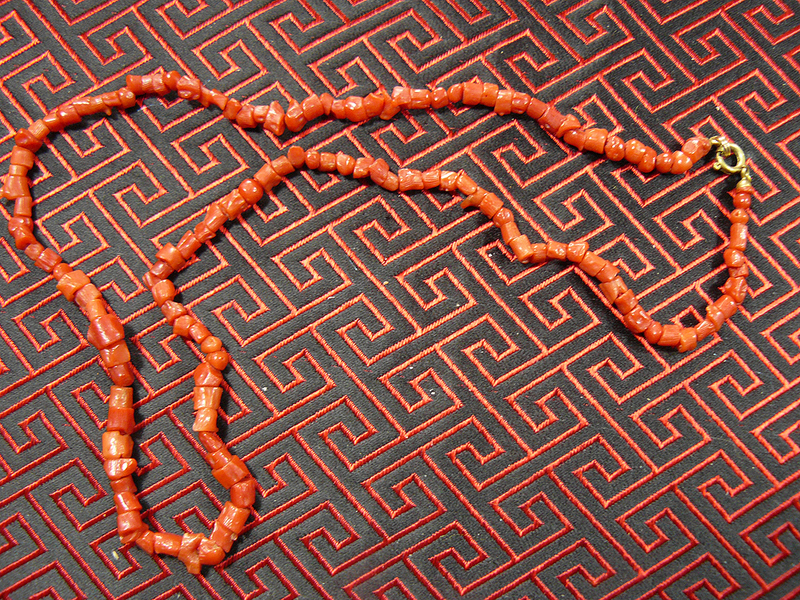 They were probabably made in Southern Europe but could have been traded to many places in the world, as coral was traded all over the Middle East, Central Asia and and even as far away as Tibet and China. 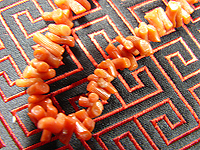 Coral has been used as a protection amulet by women - especially pregnant women - for many centuries. 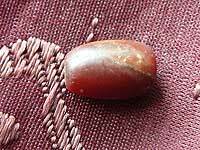 If the bead is worn during preganacy, it is generally tied to the infant after birth, so as to pass on the protection to the child. 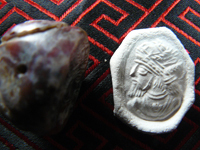 This ancient tradition is found from Southern Europe to Central Asia. 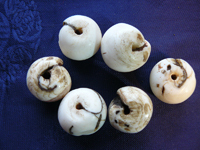 These old beads probably come from Southern Europe or perhaps Turkey, but they could come form much further afield. 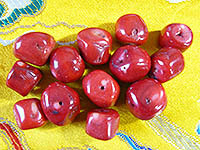 They are real protection beads, and they are carved from solid natural, undyed pink coral. 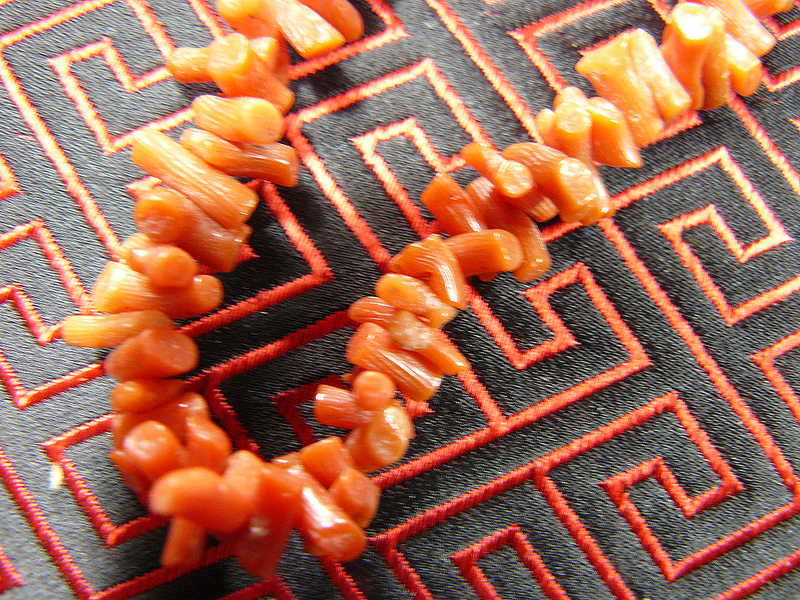 They all have 'dings' and natural cracks in them as coral often does, but they are solid and wearable with holes large enough for threading on a fine cord or chain. 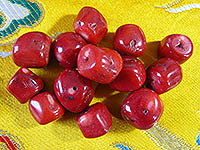 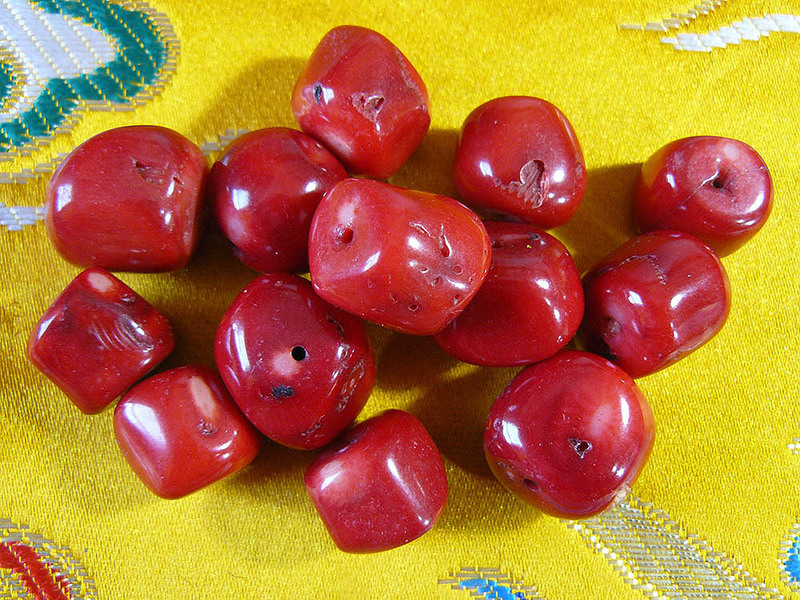 Rough shaped coral beads. 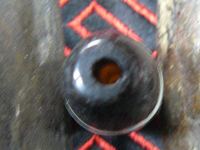 They have been enhanced. 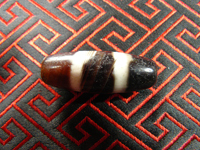 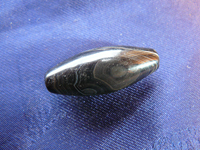 Nice for necklaces and amulets or as spacers in malas. Several in stock. 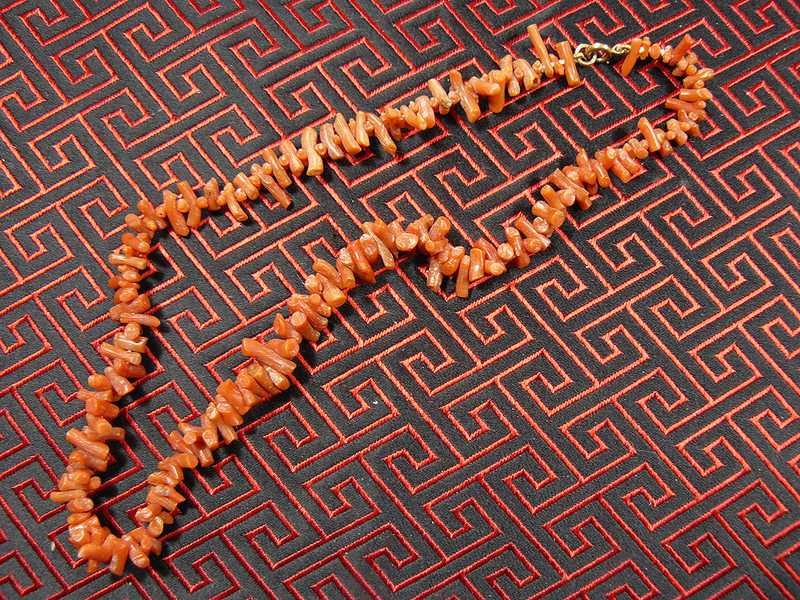 A simple necklace made of natural redish-pink coral chips. 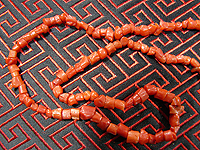 Suitable to be worn or dismantled to give a suply of coral for craftwork of offerings to the land and rivers or oceans etc. 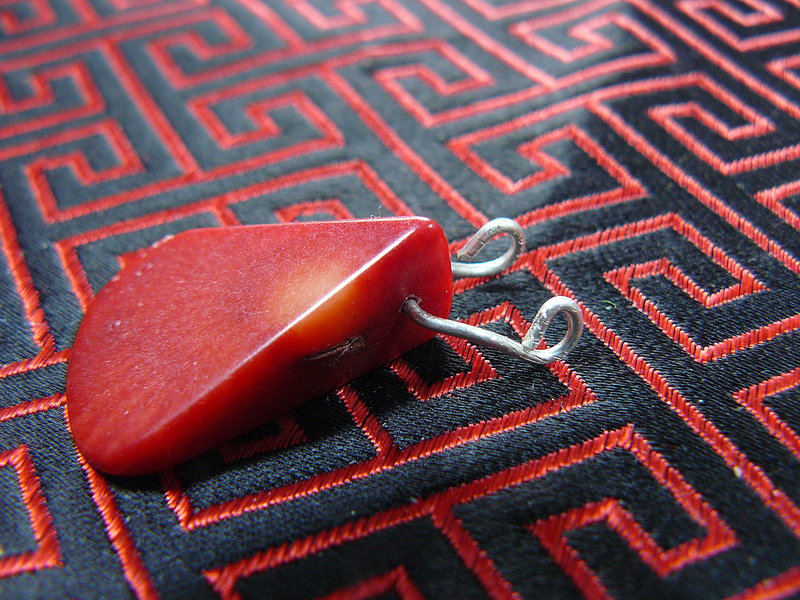 A simple wedge shaped bead of coral on a silver wire. 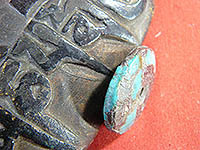 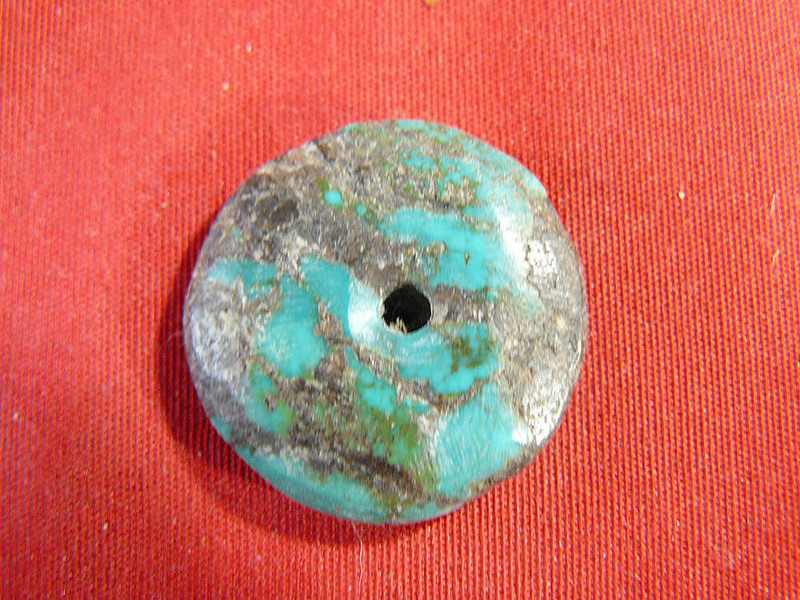 A nice turquoise donut shaped bead with a good colour and some age. 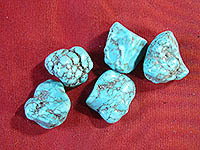 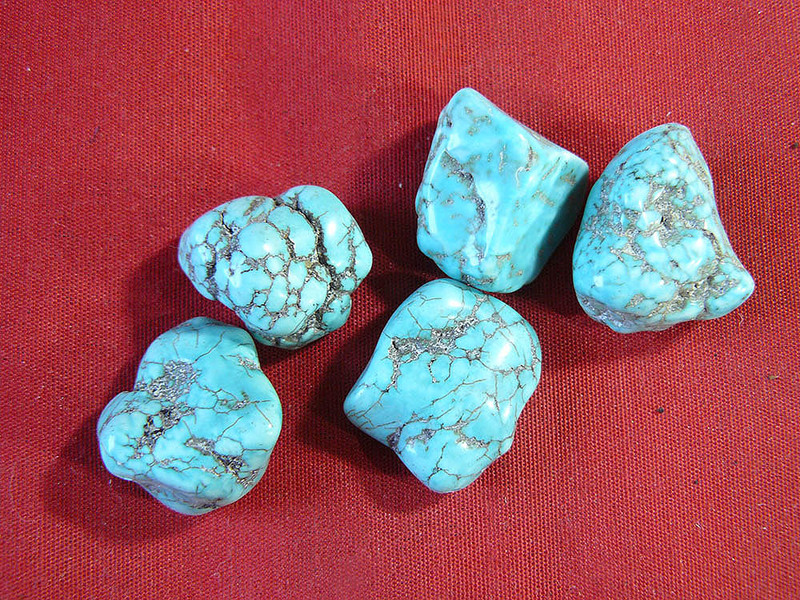 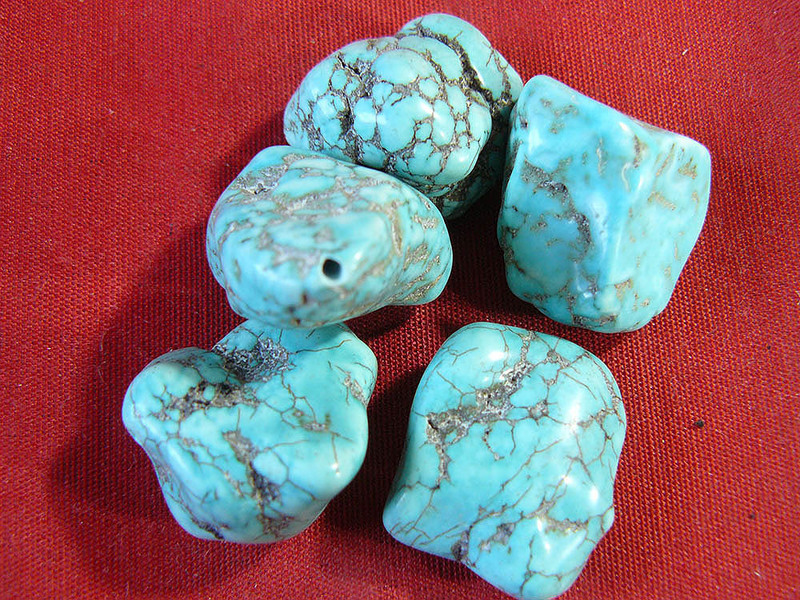 Turquoise nuget beads. Non high grade stones which have been enhanced. 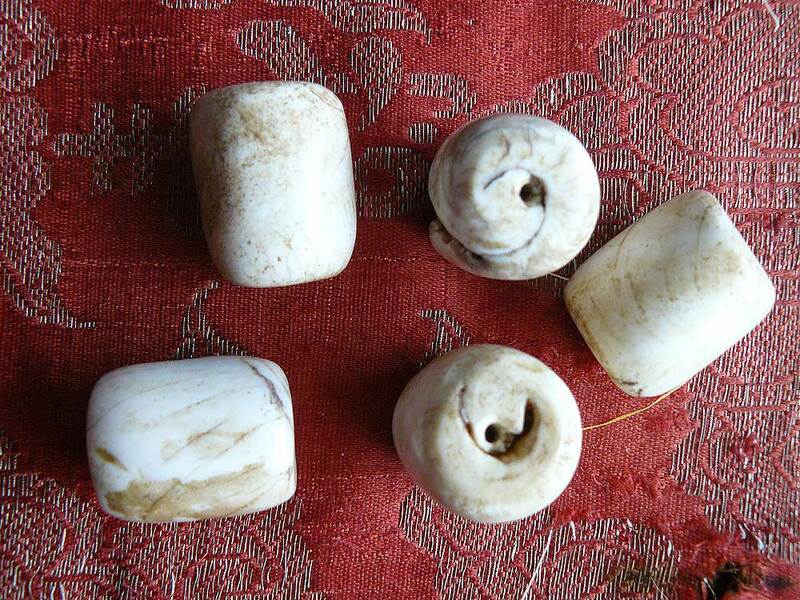 These are large, white conch shell beads from Tibet, with a nice patina. 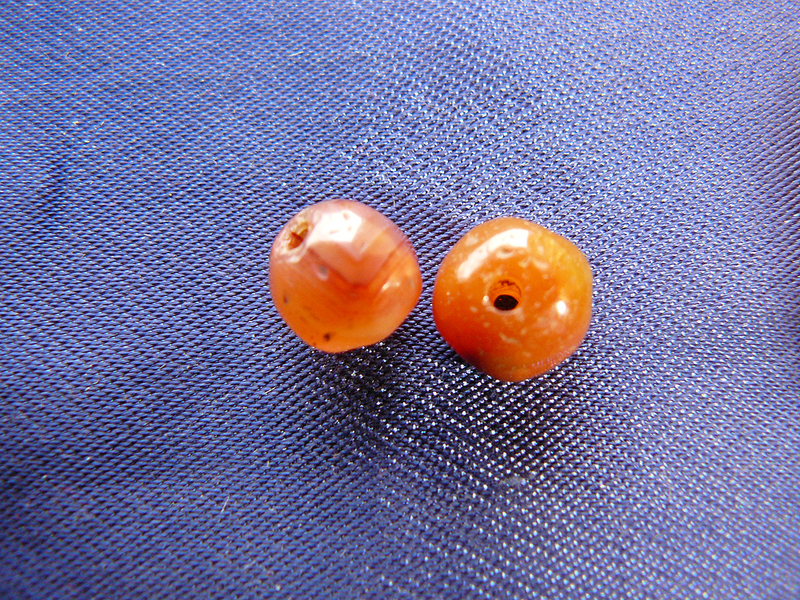 They have a hole size of around 2-3mm, and they are suitalble for a wide range of uses. 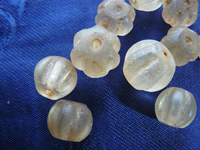 These are clear quatz or rock crystal beads with a fairly large hole in them for threading. They havea nice patina and are in good condition, making them suitalble for a wide range of uses. 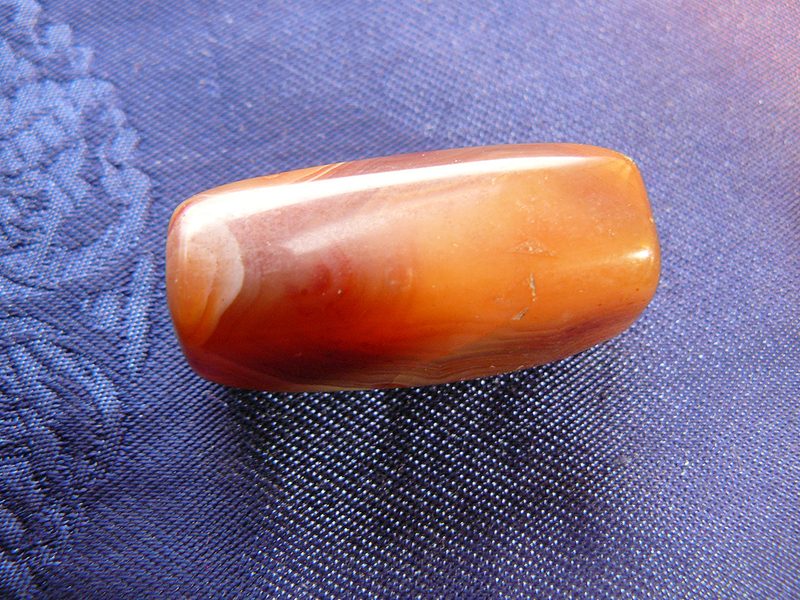 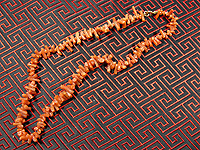 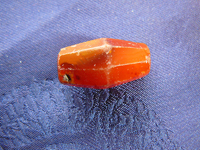 Many cultures have long prized the warm colour of carnelian. This is a hand shaped bead with a large hole for threading. 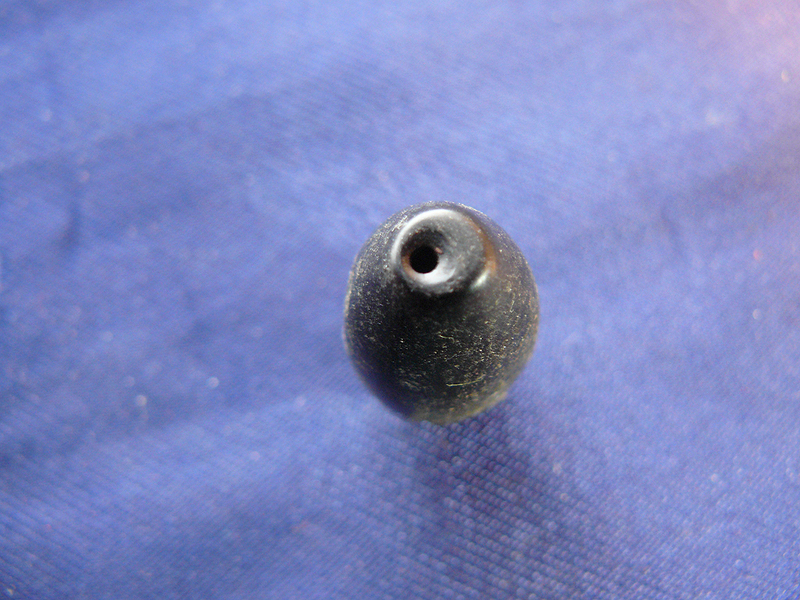 This is a hand shaped bead with a large hole for threading. 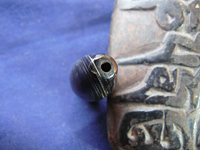 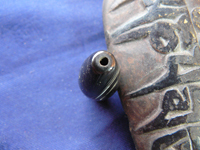 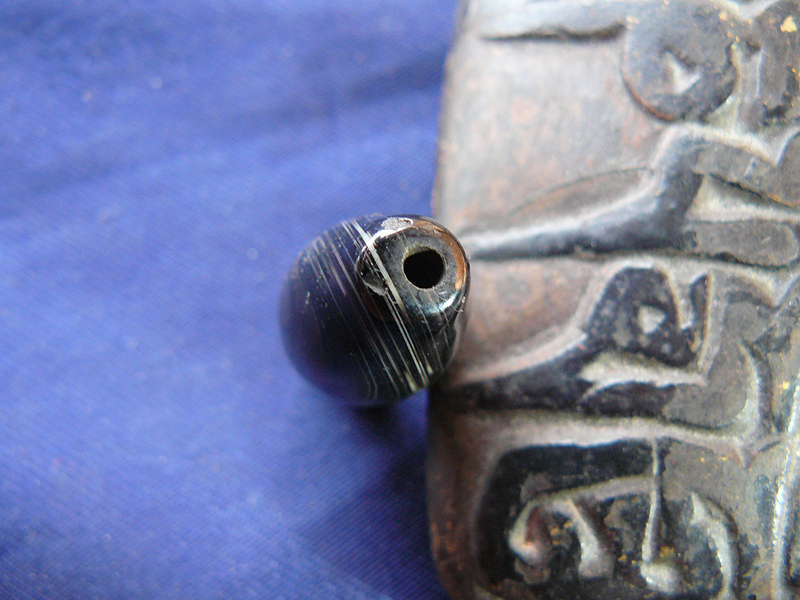 This is a hand shaped, dark coloured carnelian bead with a large hole for threading. 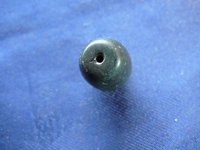 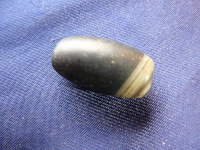 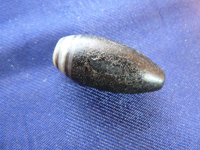 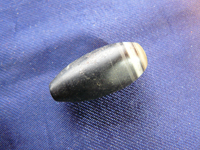 This is a large, recently made bead with a large hole for threading. 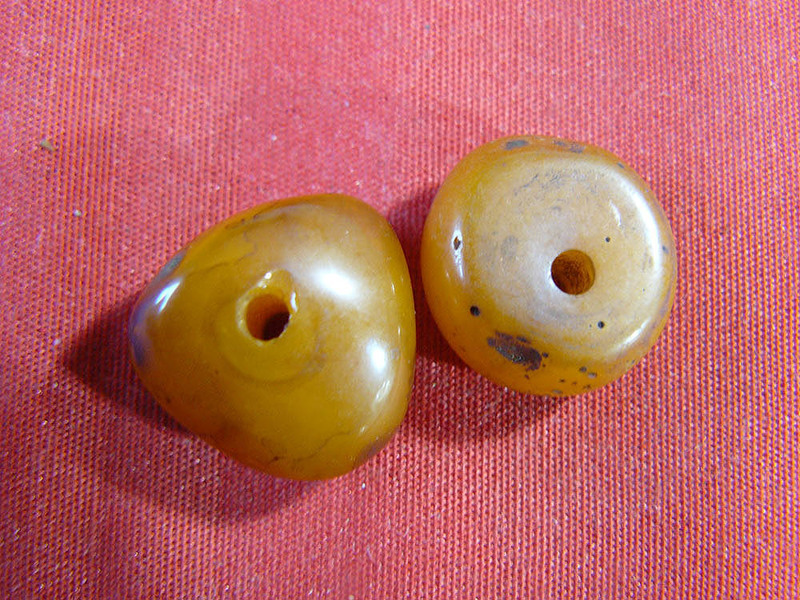 These are a pair of hand shaped beads with a large hole for threading. 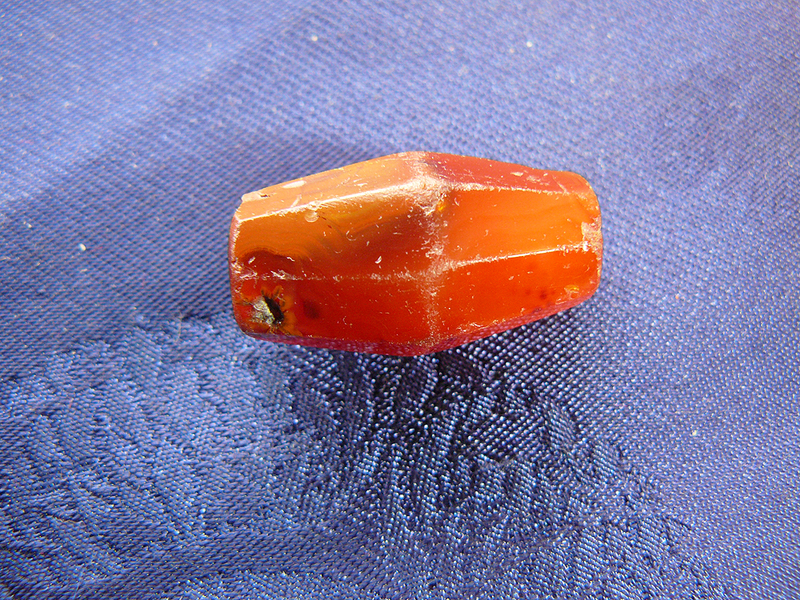 Many cultures have long prized the warm colour of carnelian. 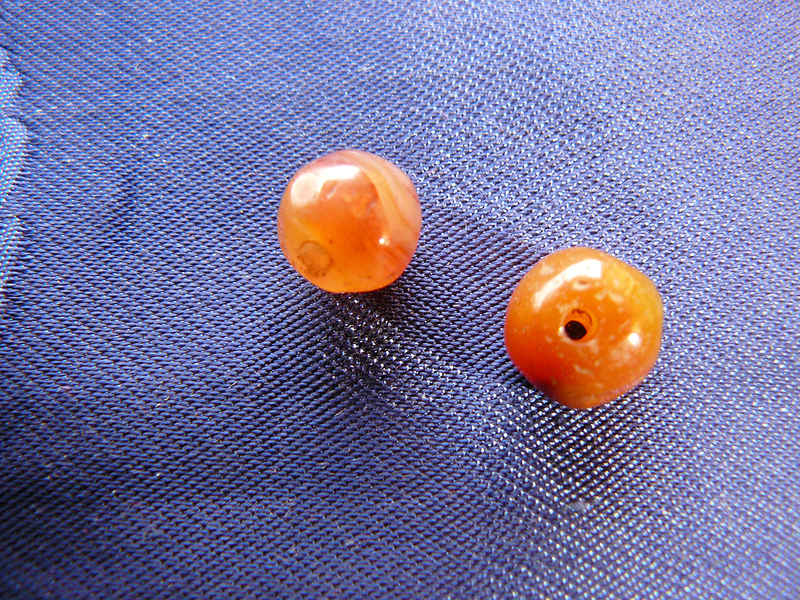 Pair of small round carnelian bead with a hole for threading. 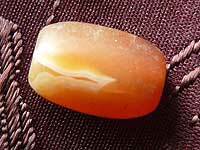 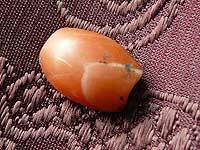 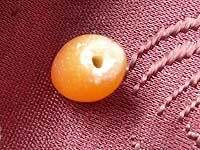 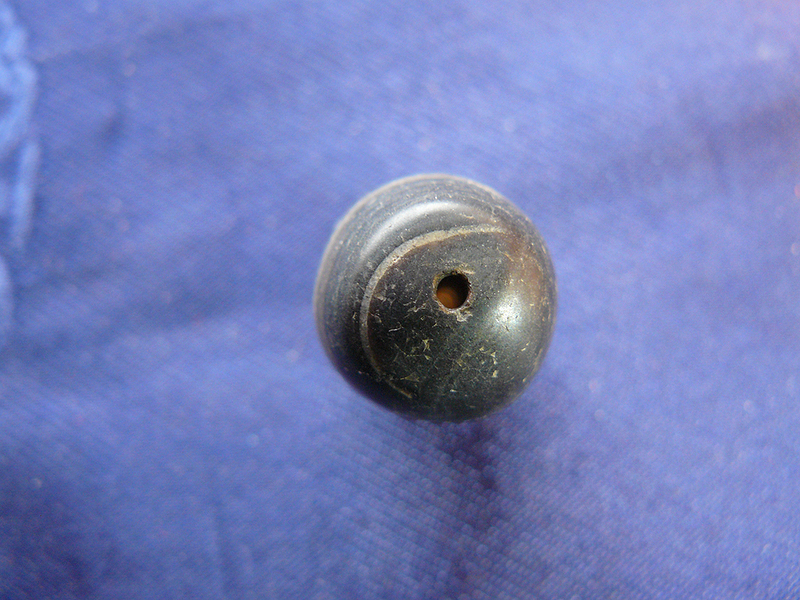 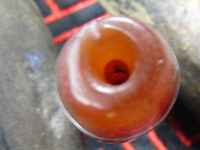 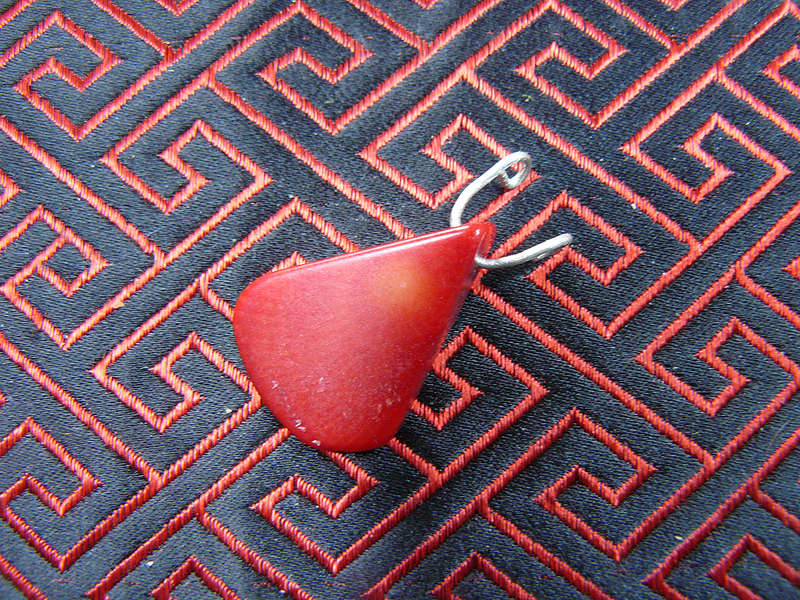 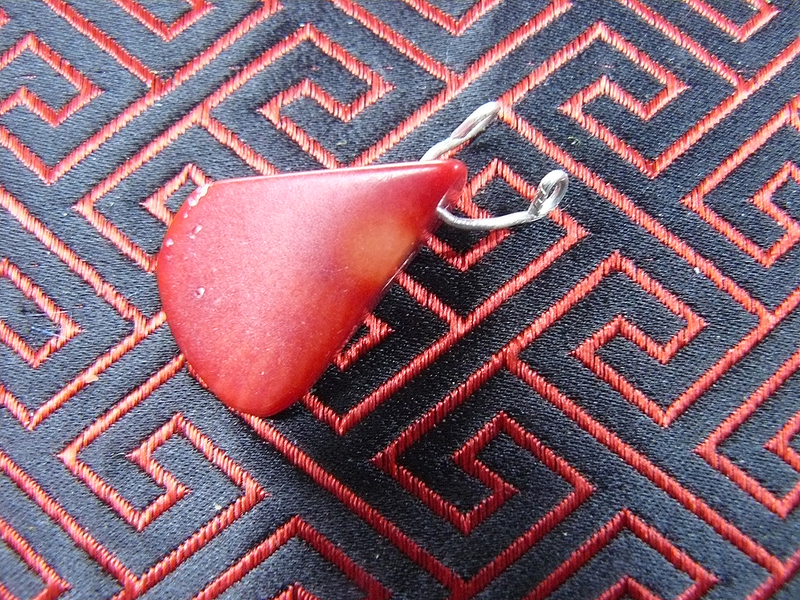 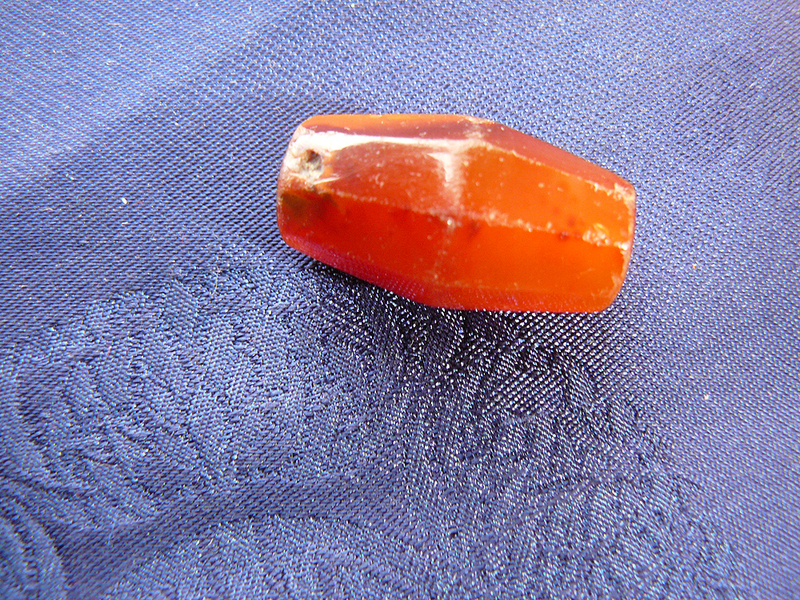 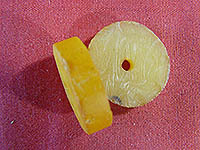 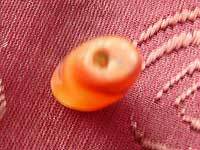 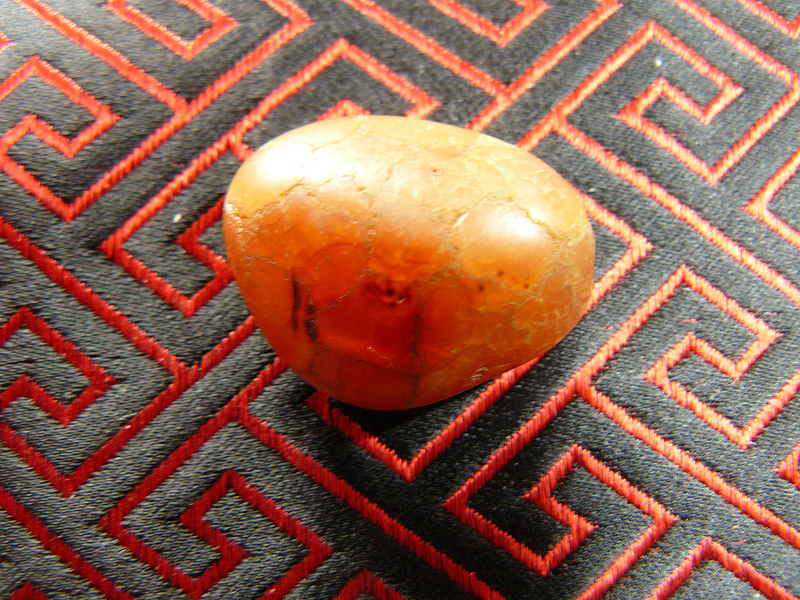 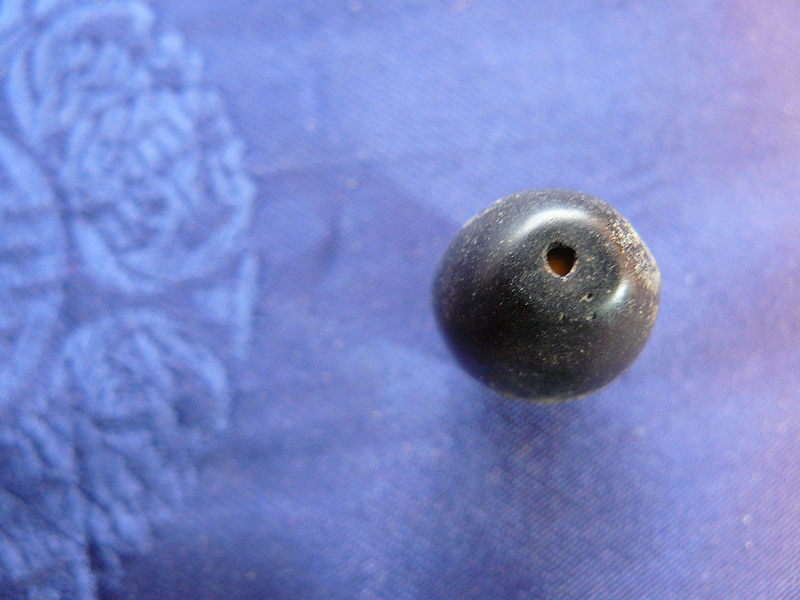 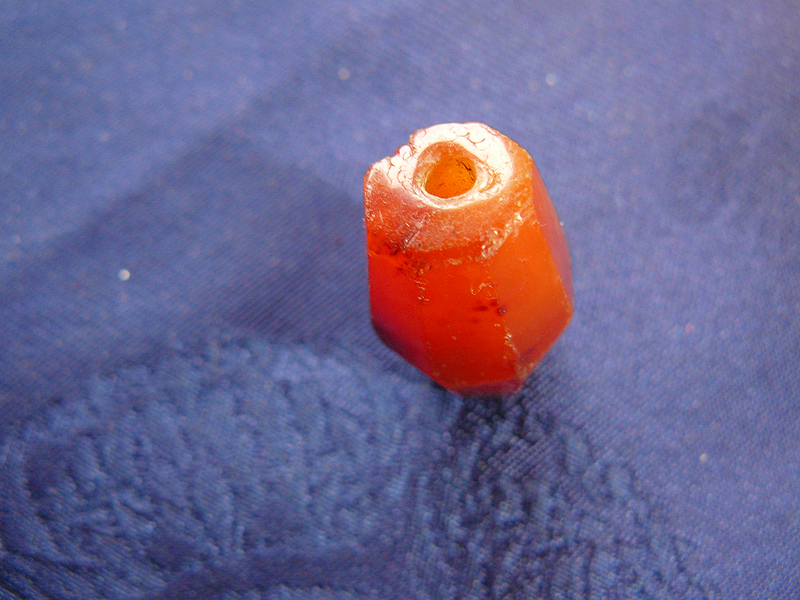 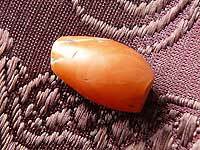 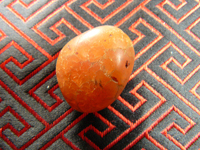 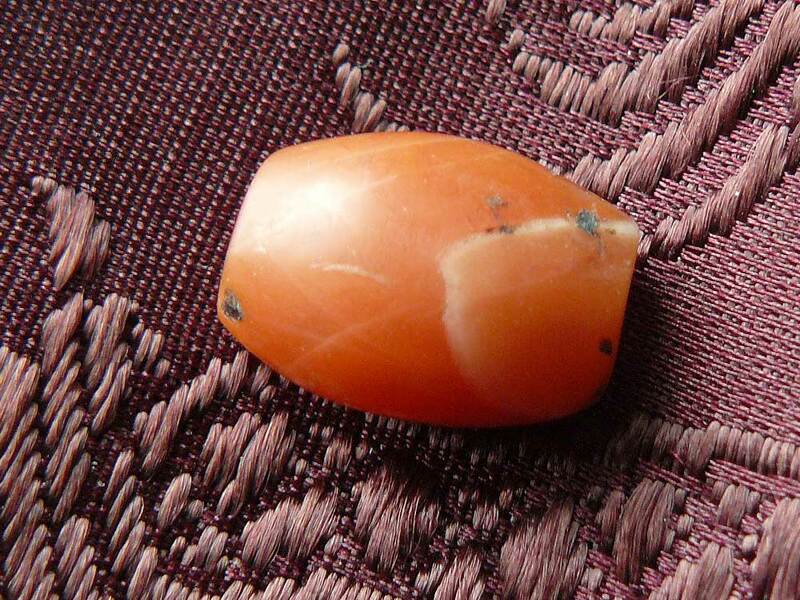 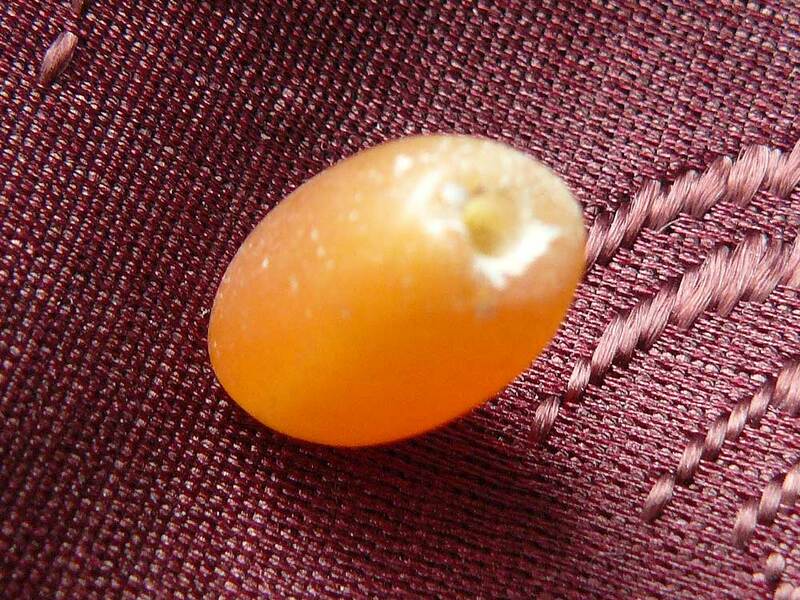 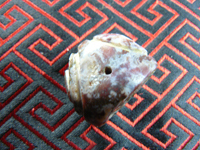 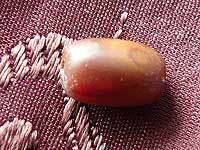 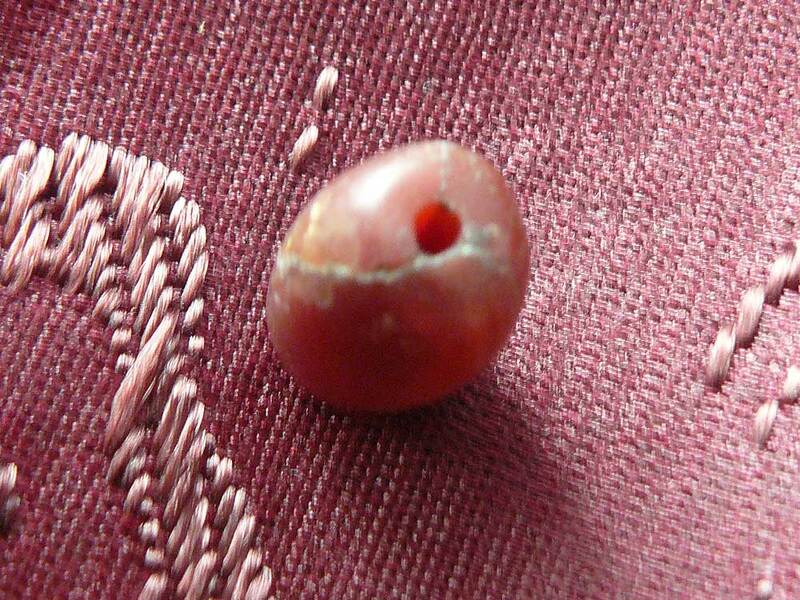 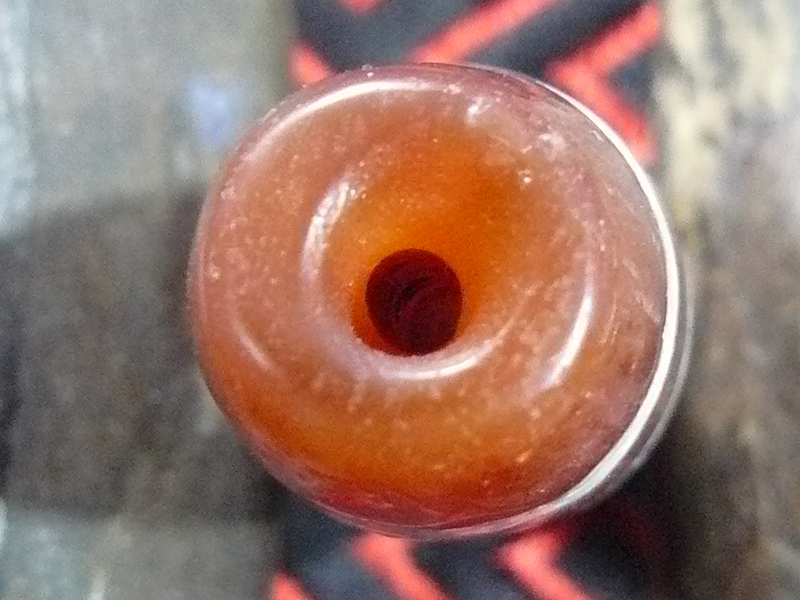 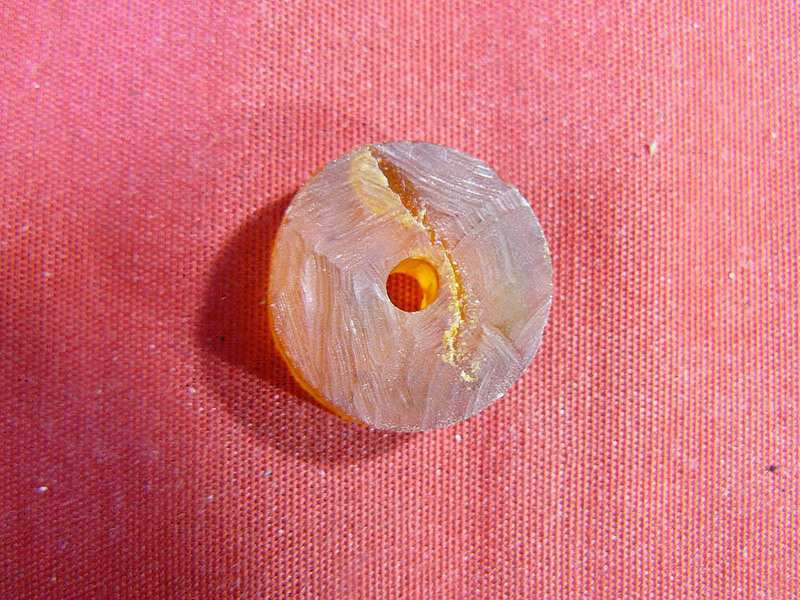 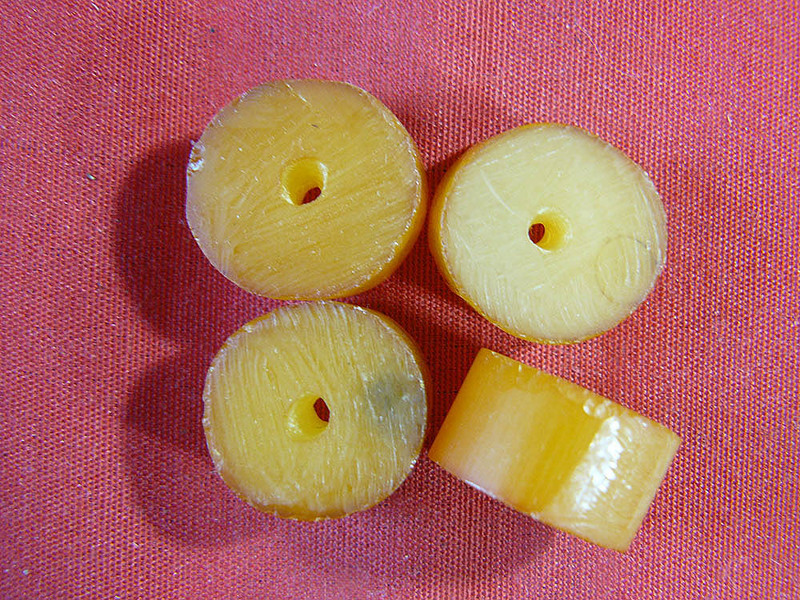 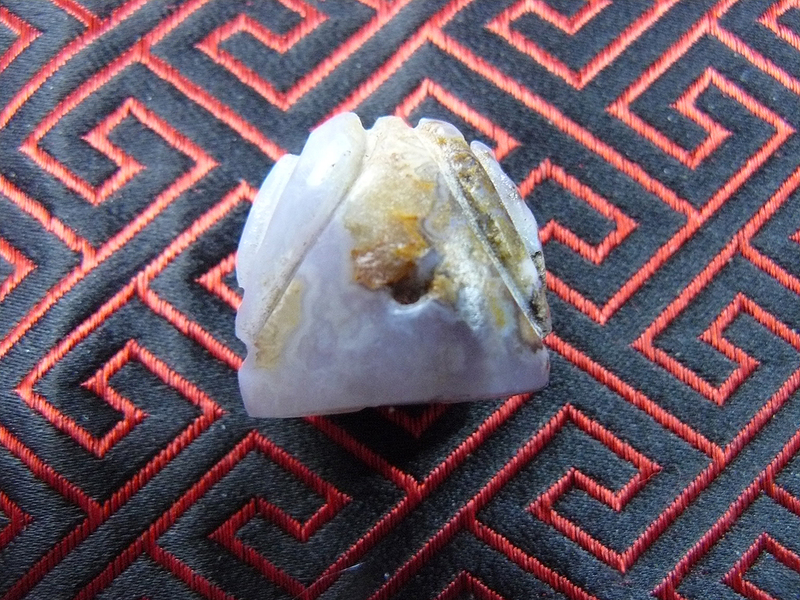 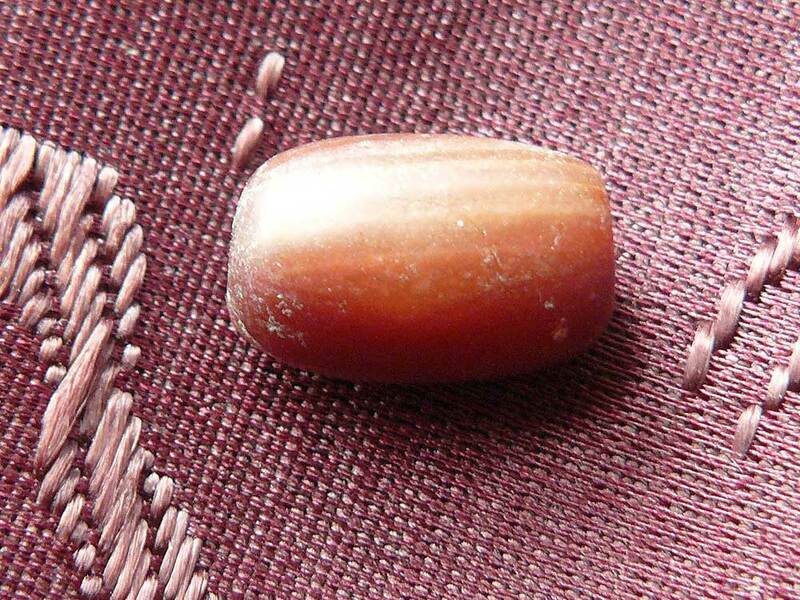 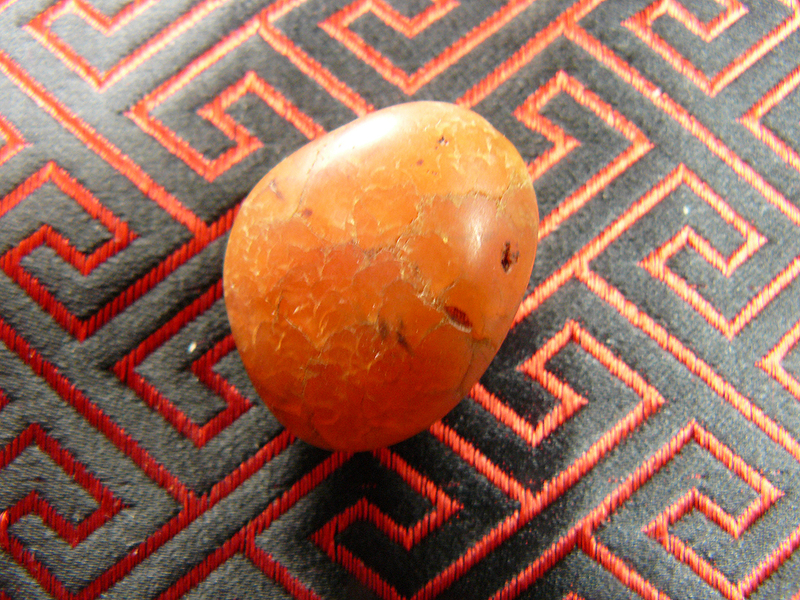 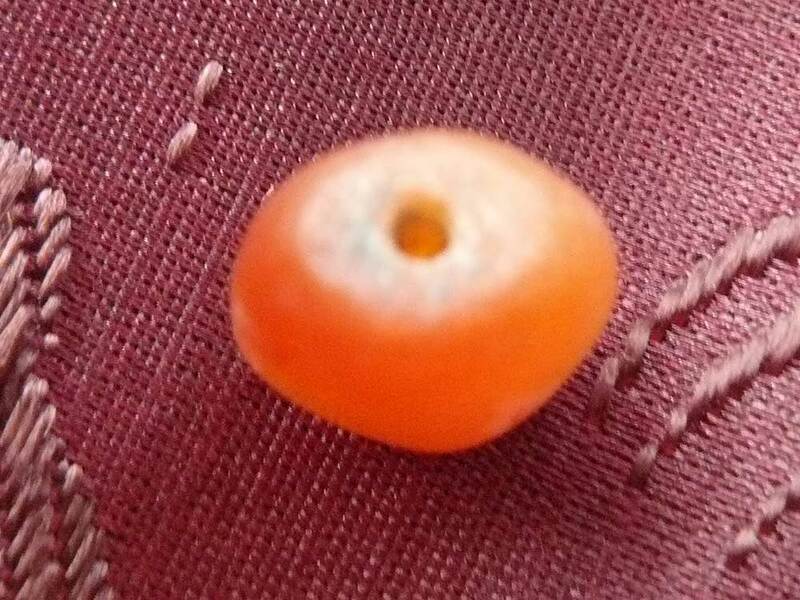 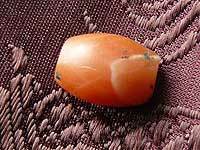 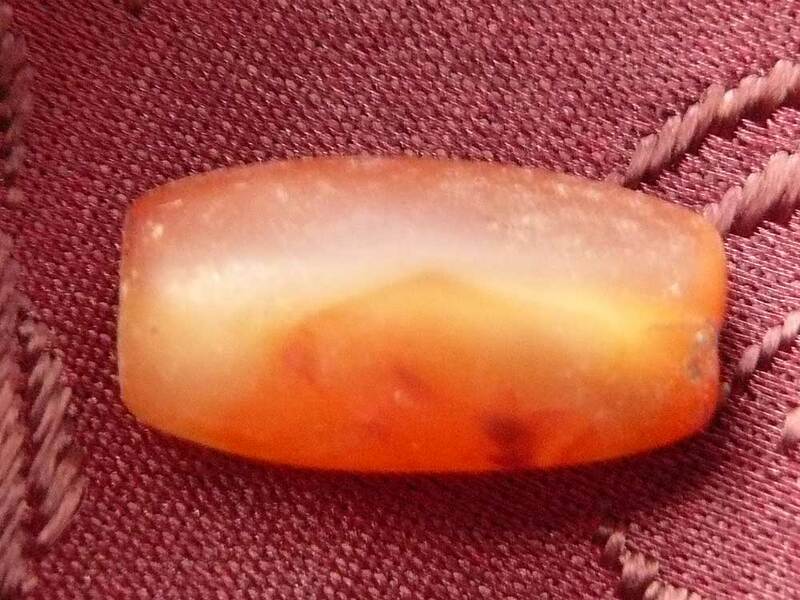 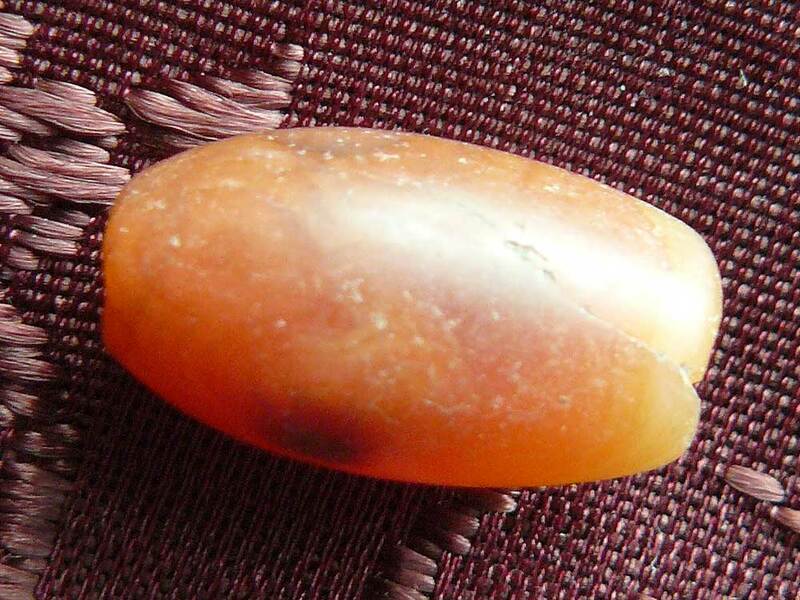 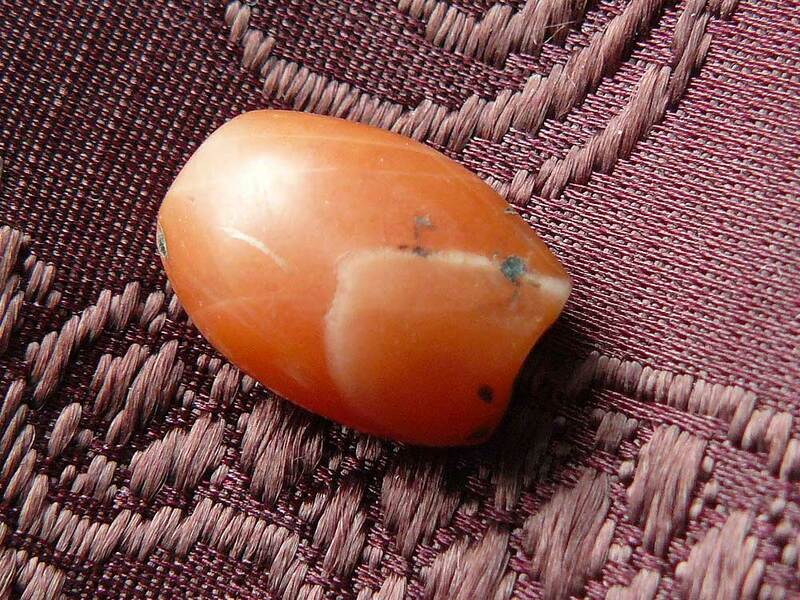 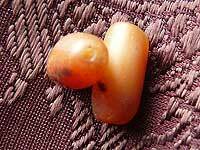 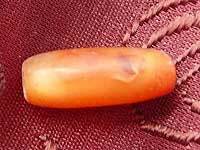 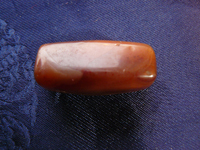 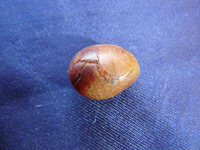 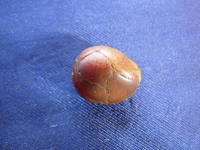 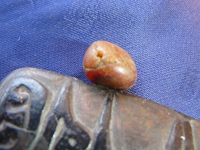 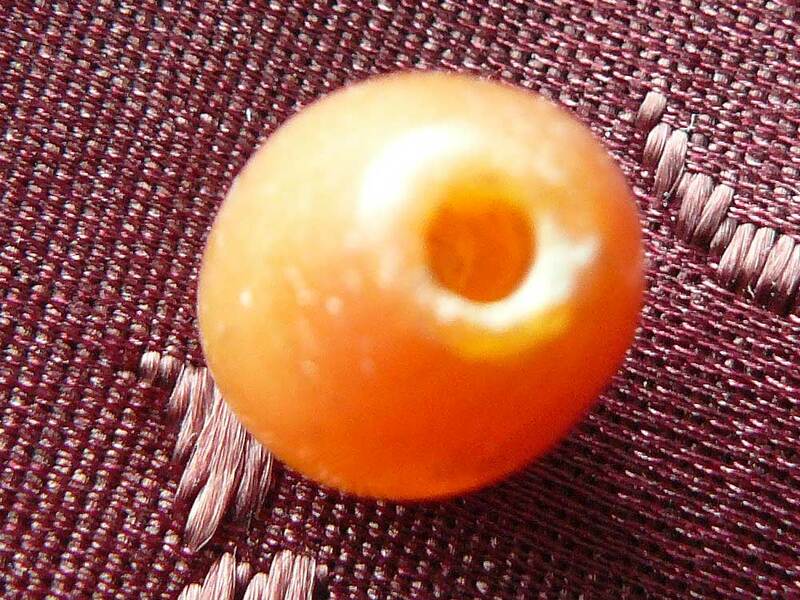 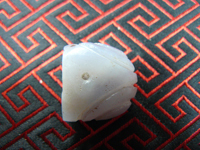 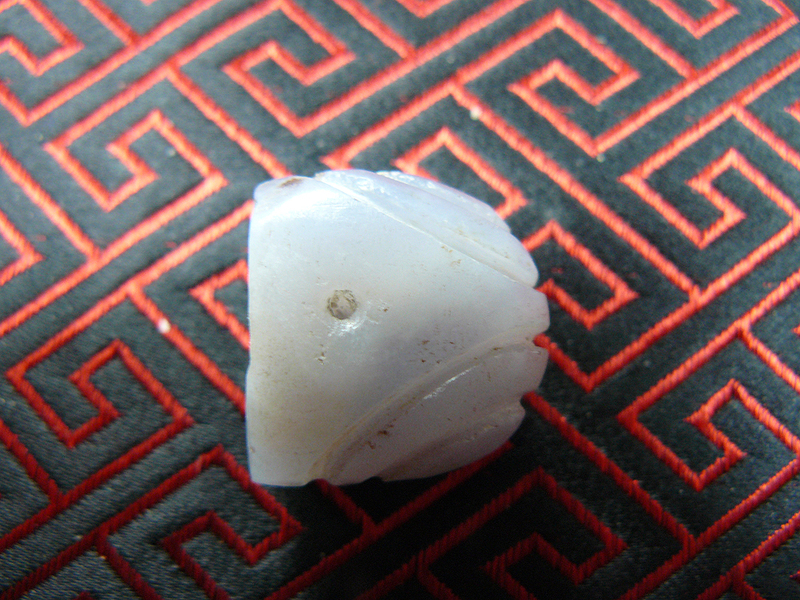 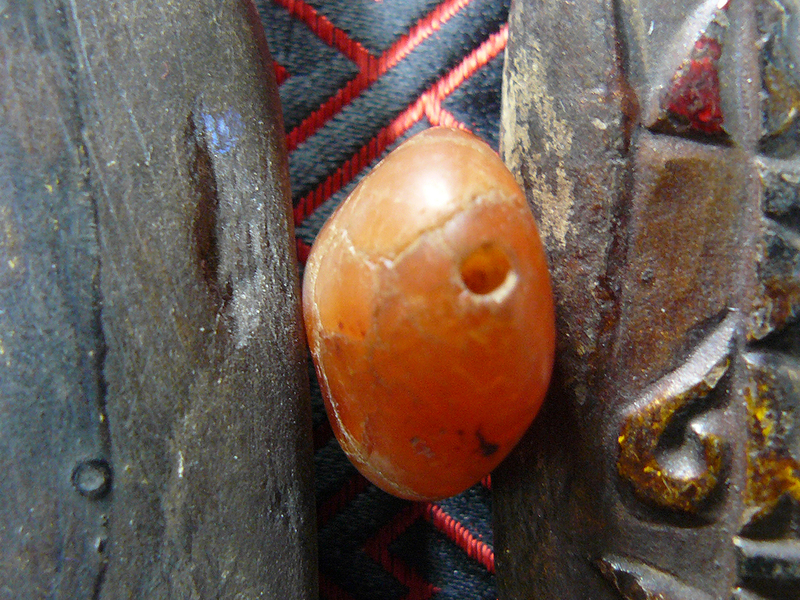 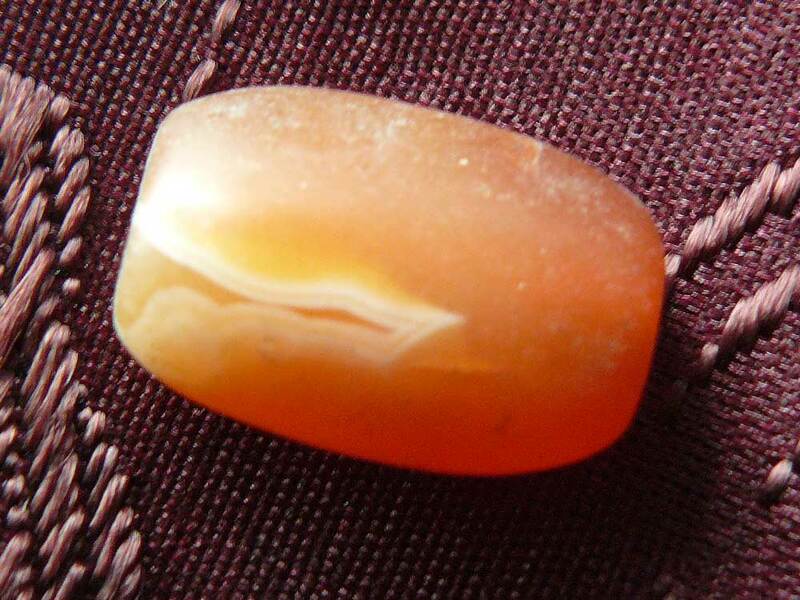 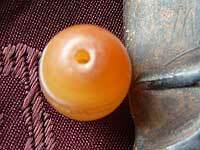 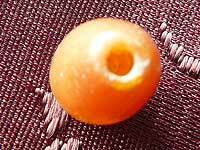 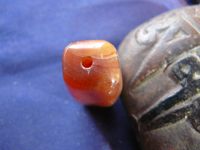 A nicely shaped carnelian bead with a hole for threading. 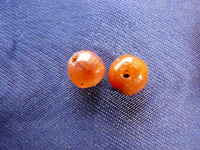 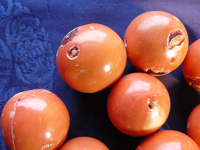 Attractive small carnelian bead with a hole for threading. 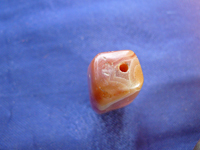 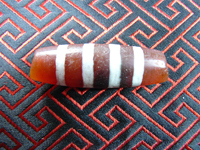 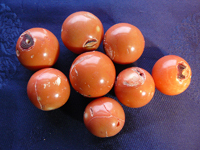 Attractive eight sided facited carnelian bead of some age with a hole for threading. 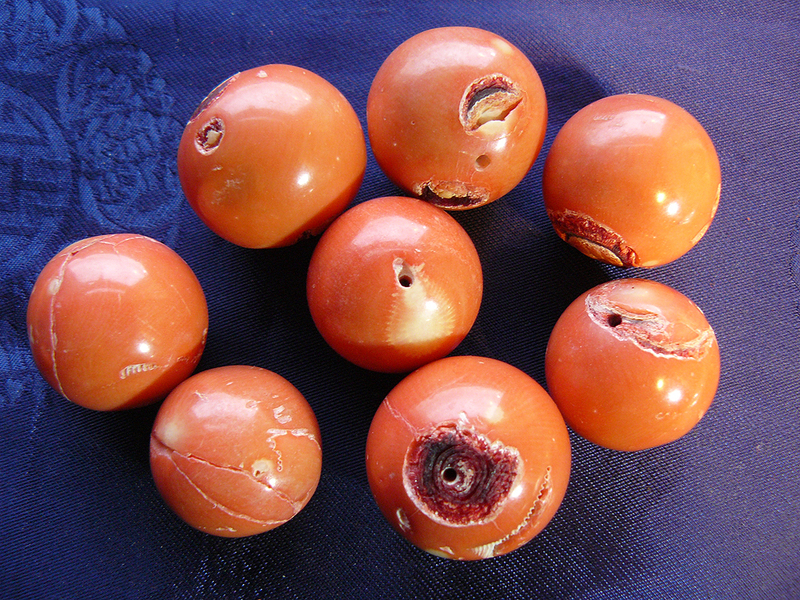 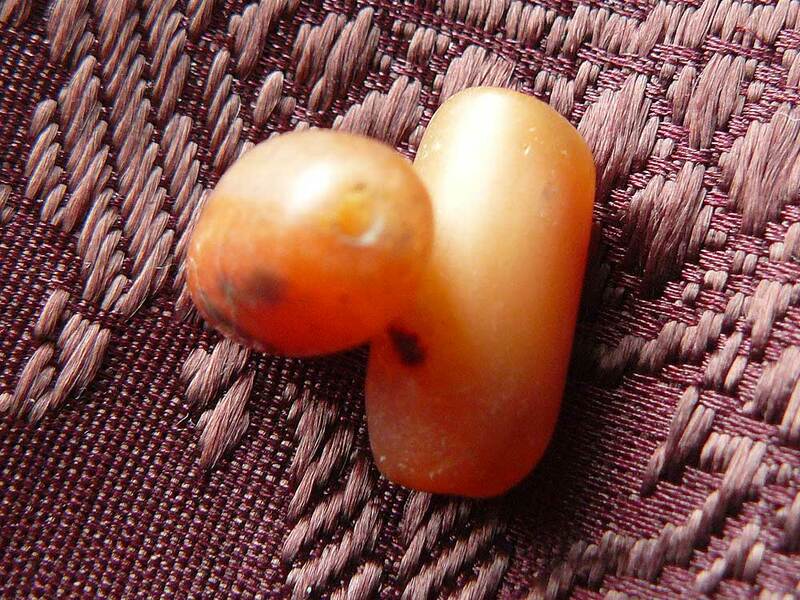 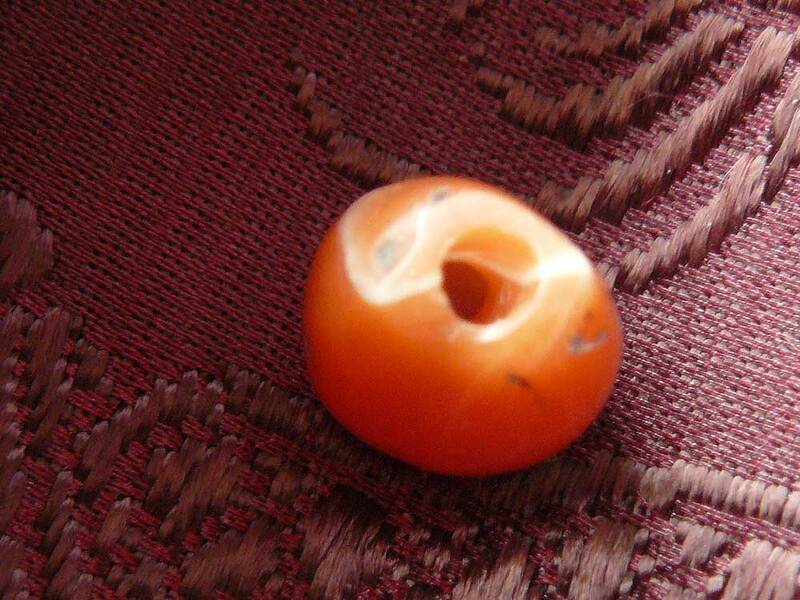 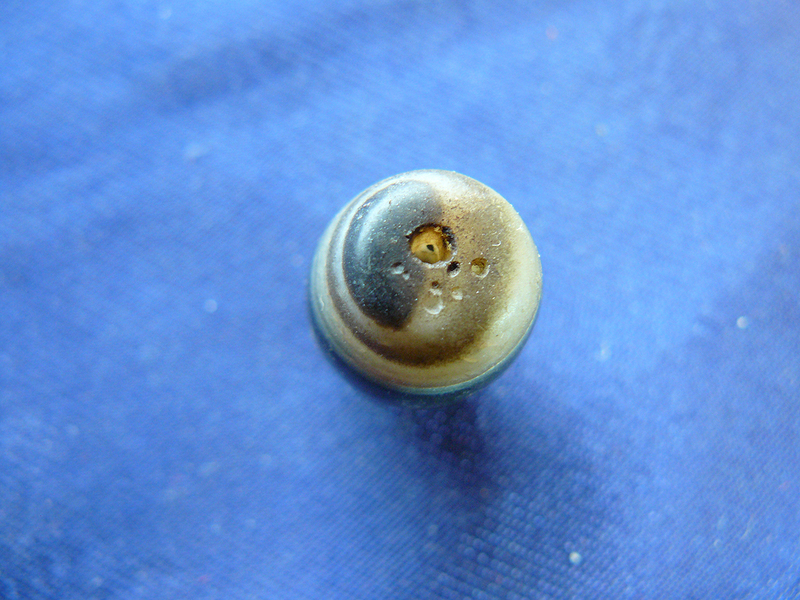 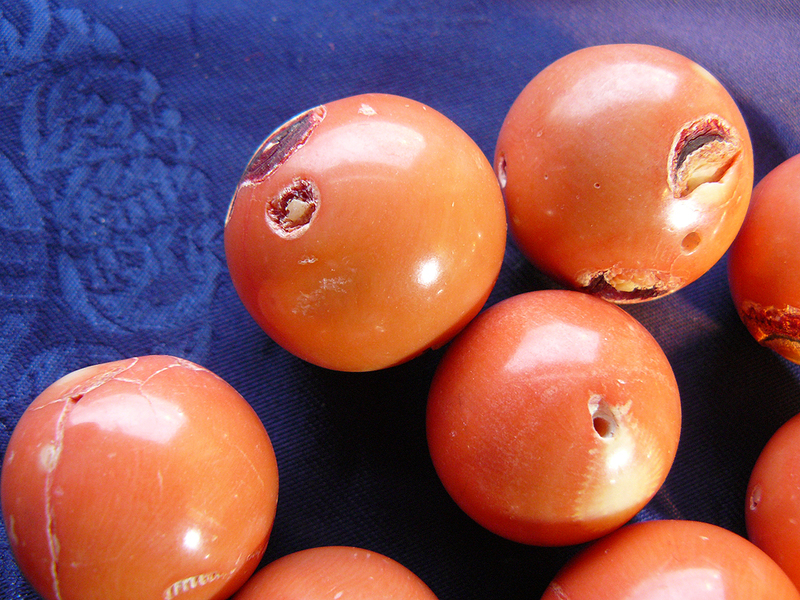 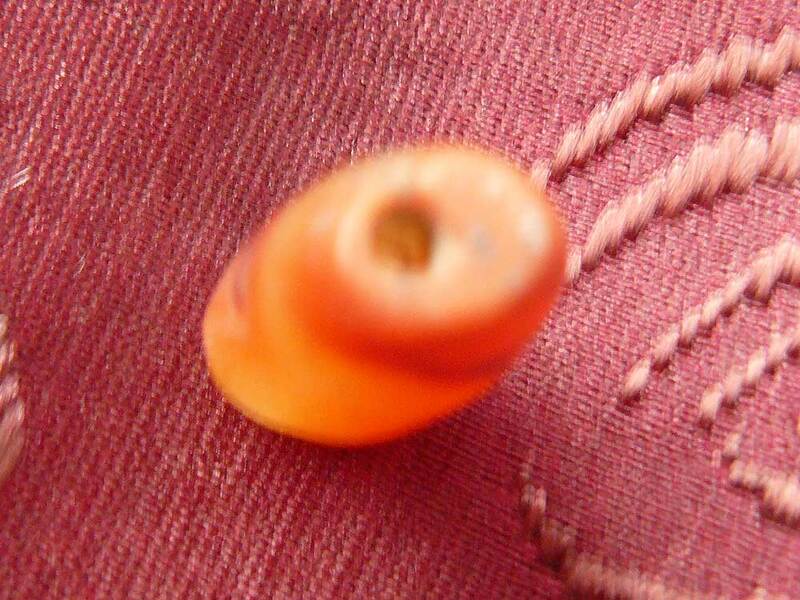 Attractive carnelian bead of some age with a hole for threading.